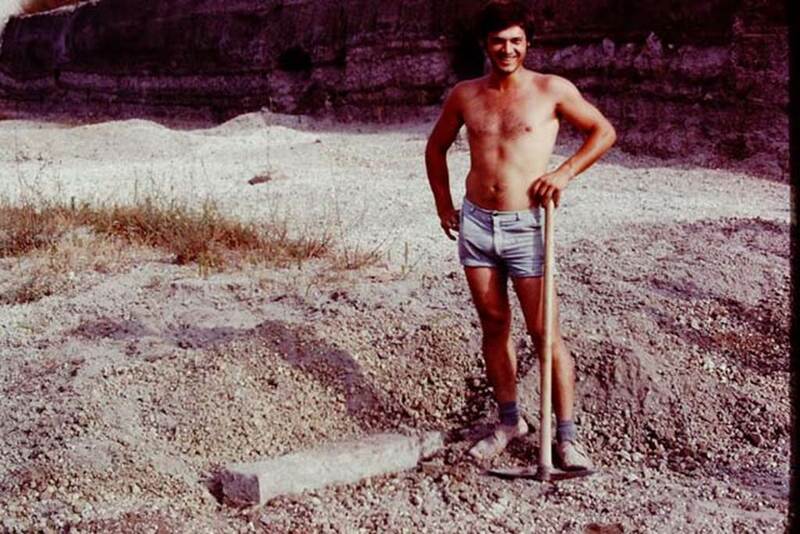 or Villa Poppaea or Oplontis Villa A.
Jashemski 1977: 1977 Jashemski excavations. 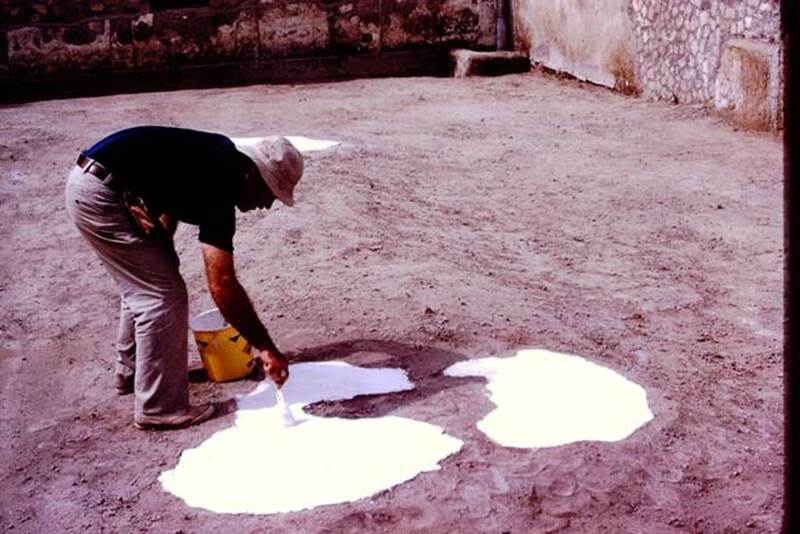 Oplontis Villa of Poppea, 1977. Area 56, looking south-west, starting to clear the remaining lapilli in the centre of the east side of the north garden. Area 56, looking to the north end of the east side of the north garden. Photo by Stanley A. Jashemski. Oplontis Villa of Poppea, 1977. 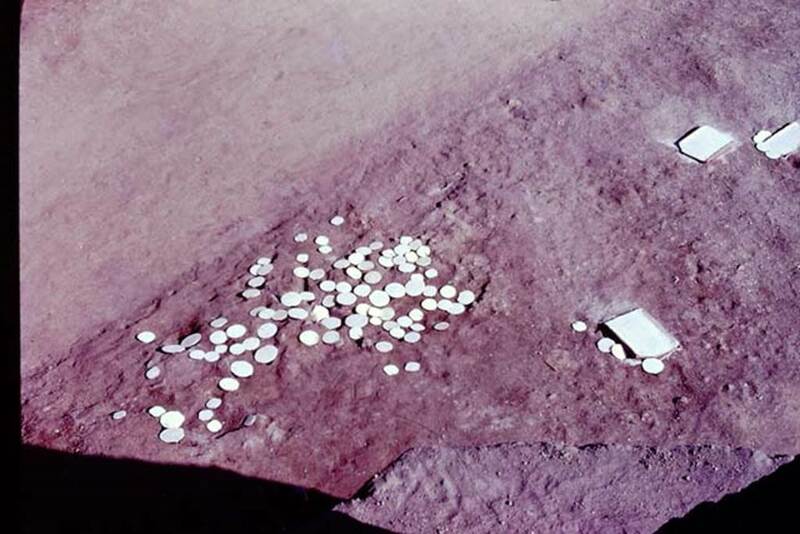 Area 56, digging through the remaining lapilli, looking north. Photo by Stanley A. Jashemski. 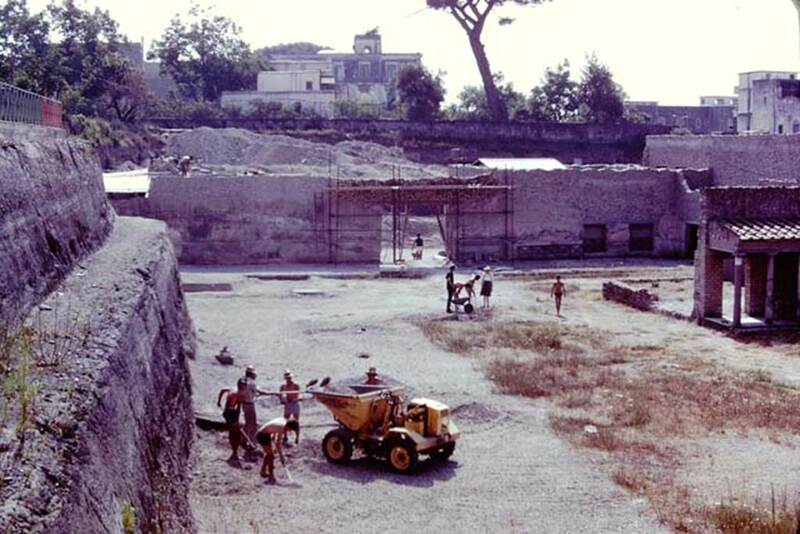 Oplontis Villa of Poppea, 1977. Area 56, looking south-east at east side of north garden. The doorway with the scaffolding would lead into room 69. The two doorways, on the right, lead into room 64. Photo by Stanley A. Jashemski. 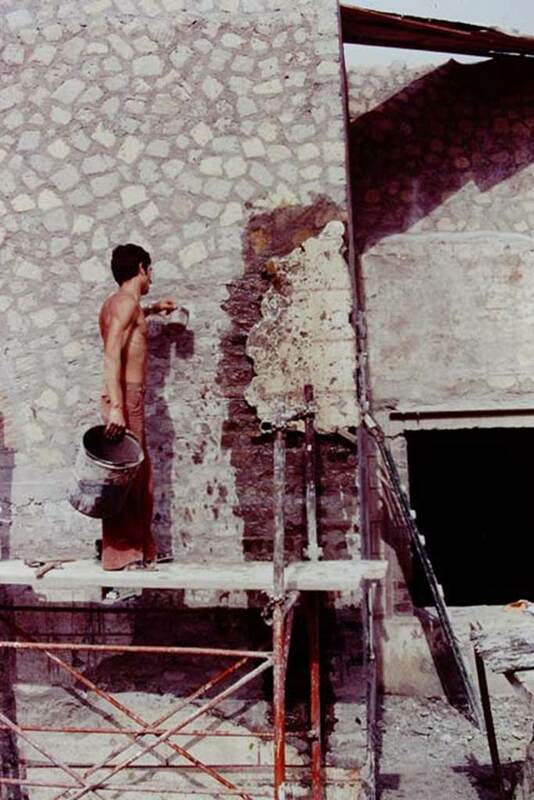 Oplontis Villa of Poppea, 1977. Discovery in the lapilli. Photo by Stanley A. Jashemski. 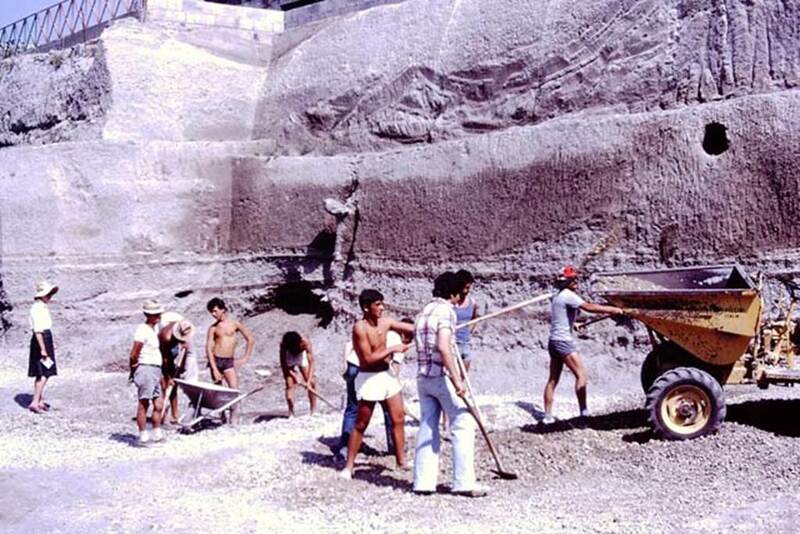 Digging through to original ground level, and the height of the eruption debris behind them. Photo by Stanley A. Jashemski. 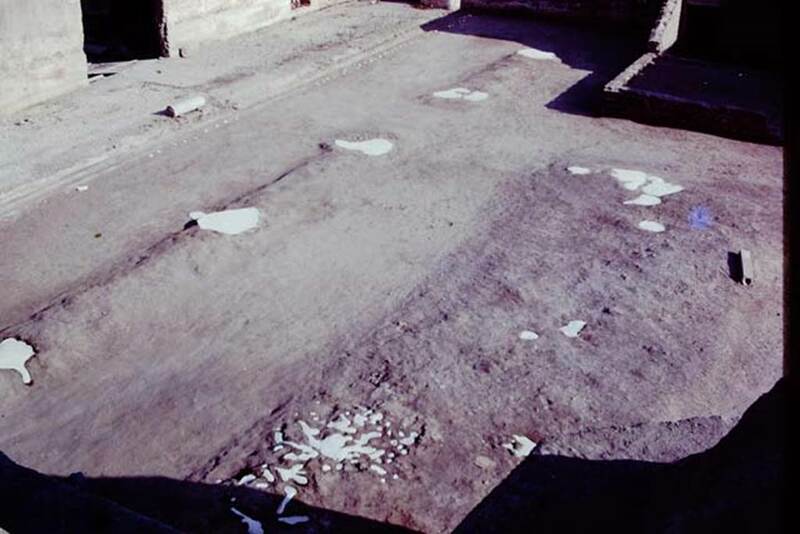 Oplontis Villa of Poppea, 1977. 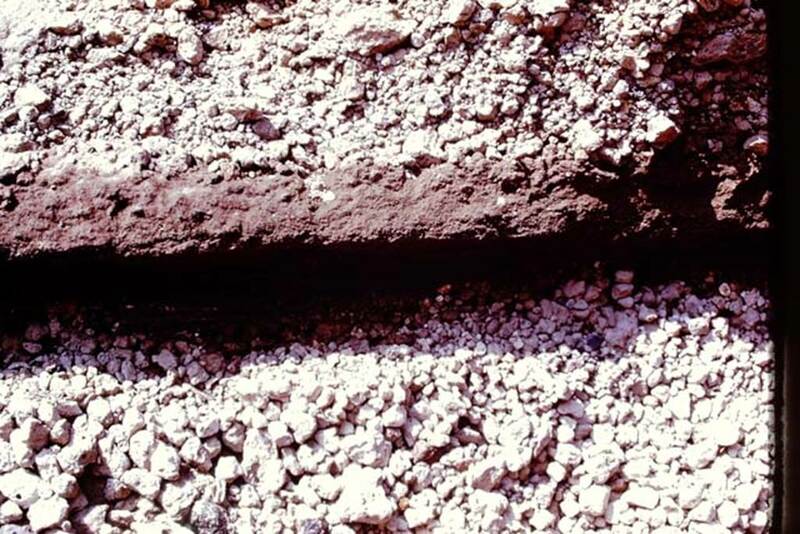 Differences in the layers of the eruption material. Photo by Stanley A. Jashemski. 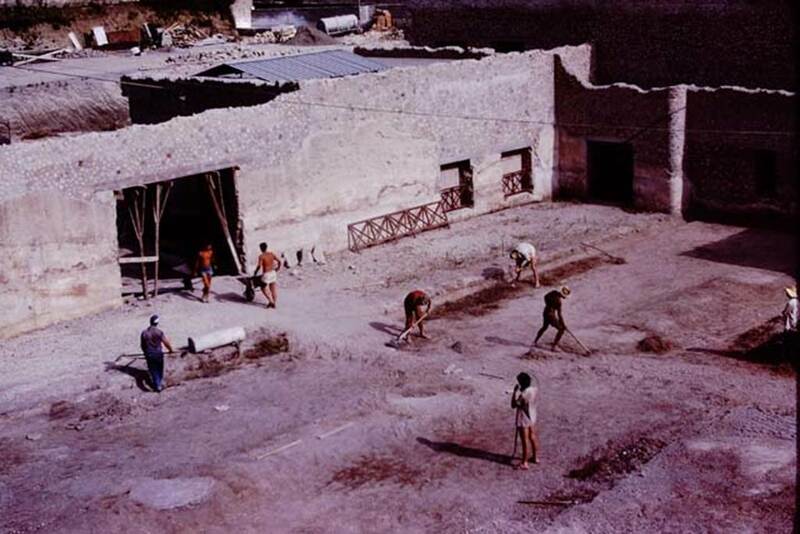 Oplontis Villa of Poppea, 1977. Digging out the debris on the east side. Photo by Stanley A. Jashemski. 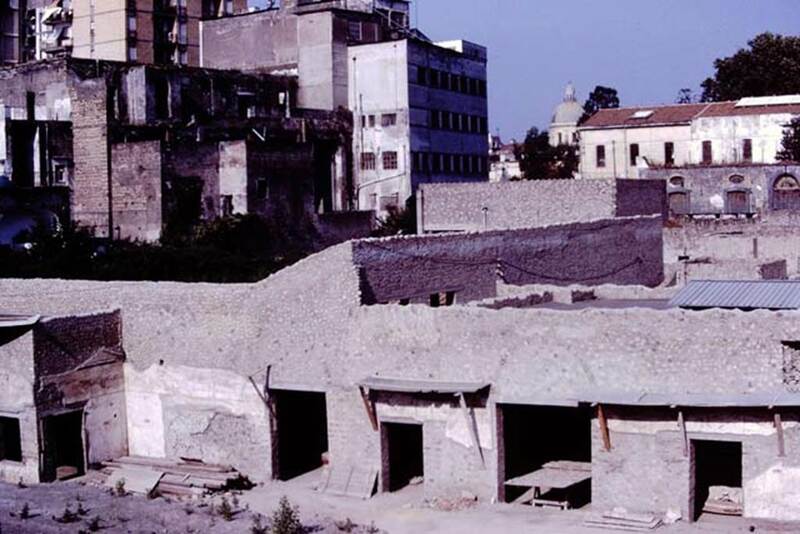 Oplontis Villa of Poppea, 1977. Removal of the debris. Photo by Stanley A. Jashemski. 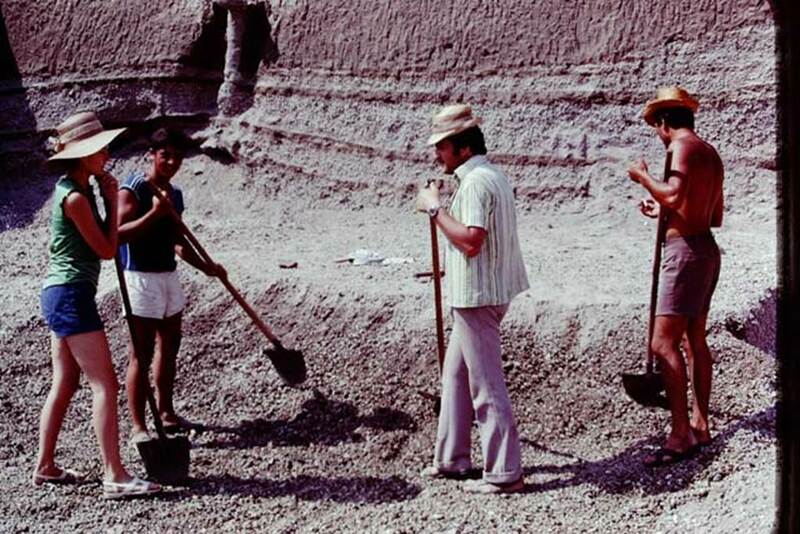 Oplontis Villa of Poppea, 1977. Found in the lapilli. Photo by Stanley A. Jashemski. Room 34, siesta time in the east portico. Photo by Stanley A. Jashemski. Area 56, looking east towards doorway to room 69, and consolidation work. Photo by Stanley A. Jashemski. 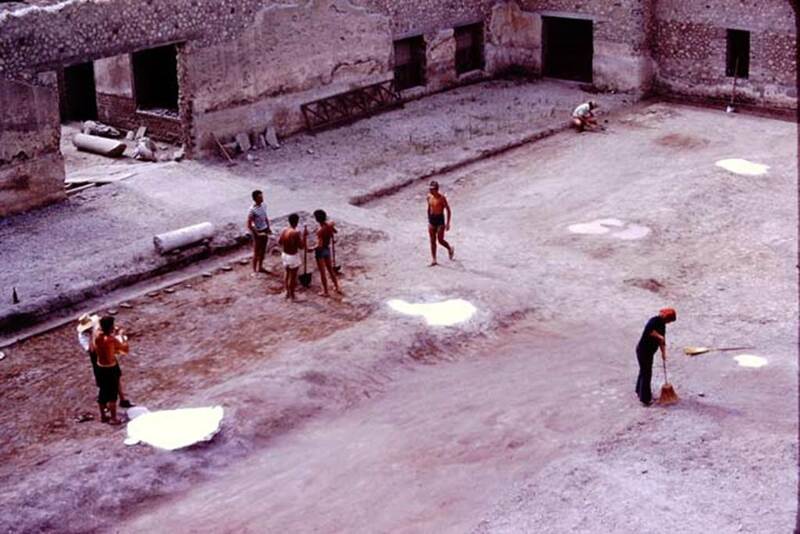 Oplontis Villa of Poppea, 1977. Reconstruction of the villa, looking south. The two figures on the left are on the roof of room 74. The square hole is the void in the roof above room 70, a small raised courtyard garden. Photo by Stanley A. Jashemski. 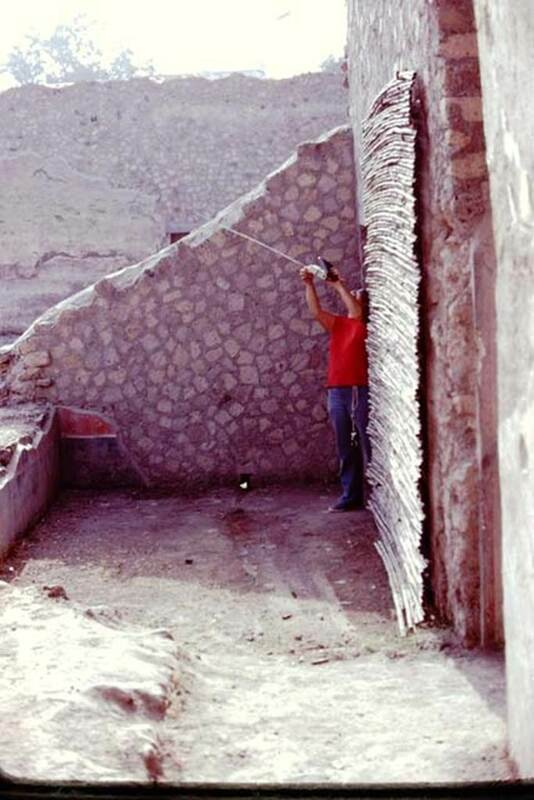 Oplontis Villa of Poppea, 1977. Reconstructing the roof of room 74. Photo by Stanley A. Jashemski. 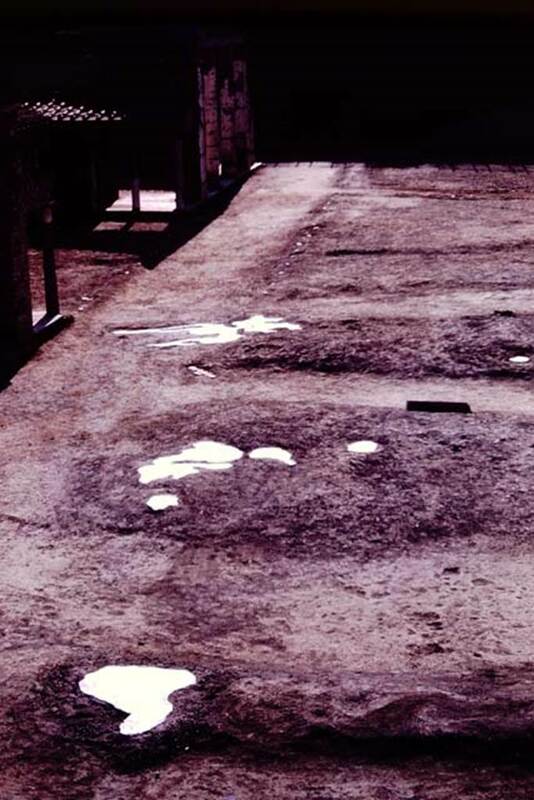 Looking south along area 60, before excavation and reconstruction. Photo by Stanley A. Jashemski. Looking south-west across east end of north garden. Photo by Stanley A. Jashemski. Oplontis Villa of Poppea, 1977. Looking west along north garden, digging through the lapilli to the original soil level. Looking west along north side of excavated area. Photo by Stanley A. Jashemski. 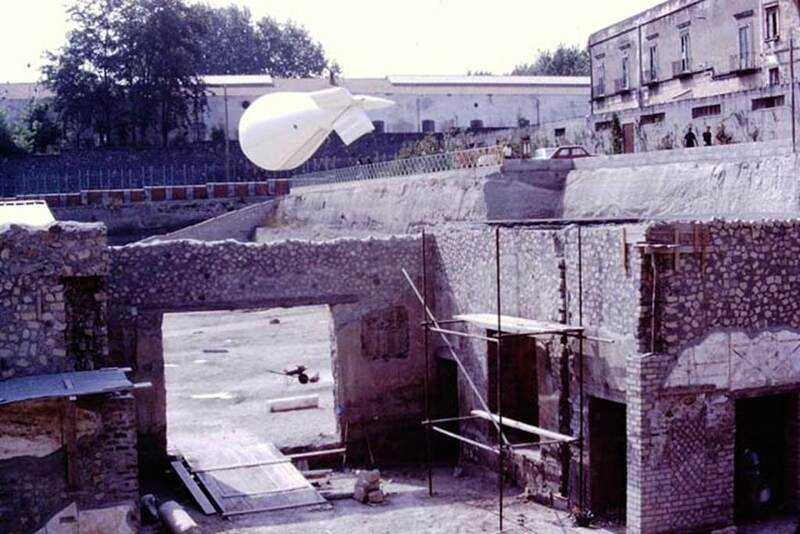 Oplontis Villa of Poppea, 1977. Taking a pause in their digging. Photo by Stanley A. Jashemski. 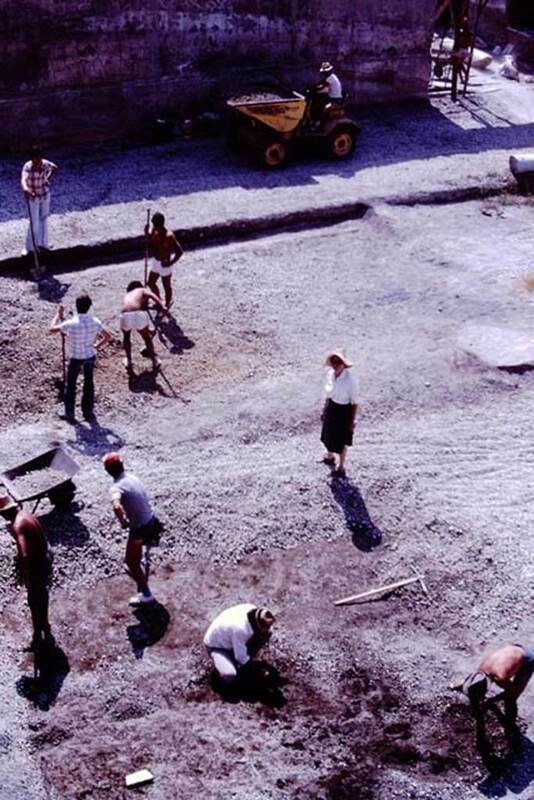 Oplontis Villa of Poppea, 1977. 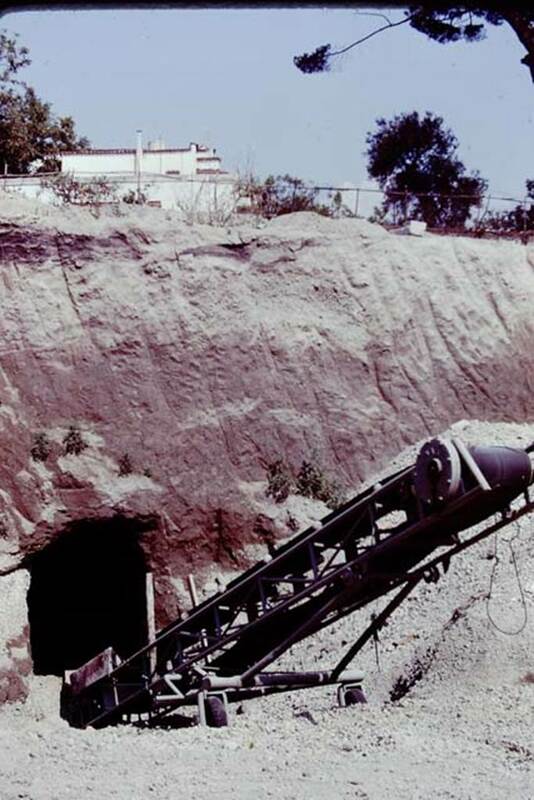 Shaft of herm emerging from the lapilli. Photo by Stanley A. Jashemski. 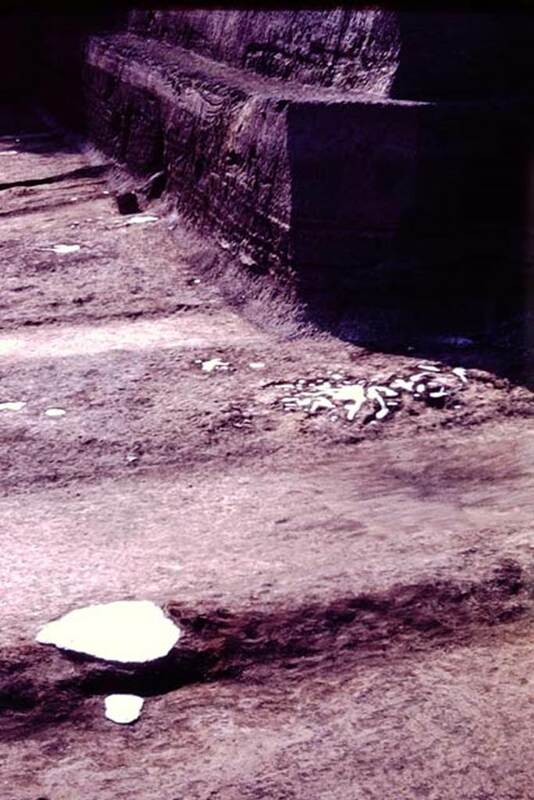 Oplontis Villa of Poppea, 1977. Area 60, south-west end of portico facing the pool, looking south. On the right is the doorway to room 65, then the smaller doorway of room 63, and then the doorway into room 46, the corridor with the benches. In the centre, ahead, is a window to room 78, and one to room 66. Photo by Stanley A. Jashemski. Area 60, south-west end of portico facing the pool, looking west. Photo by Stanley A. Jashemski. 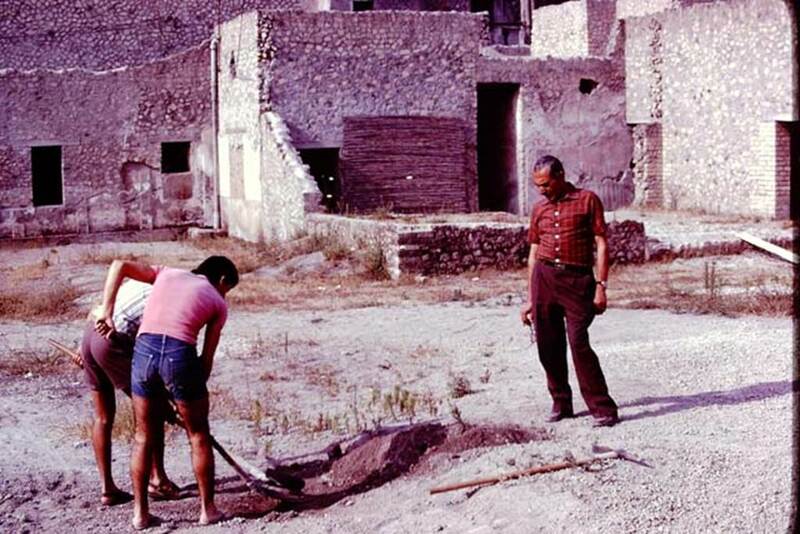 Oplontis Villa of Poppea, 1977. Area 60, south-west end of portico facing the pool, looking south-west. The doorway to room 76 is the second doorway from the right. Photo by Stanley A. Jashemski. 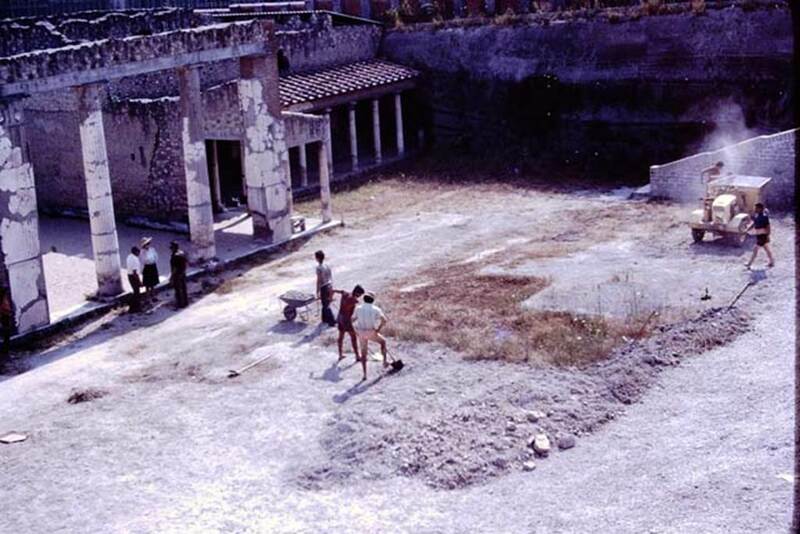 Oplontis Villa of Poppea, 1977. Area 60, white wall of the portico facing the pool, on north side of doorway to room 76. Photo by Stanley A. Jashemski. 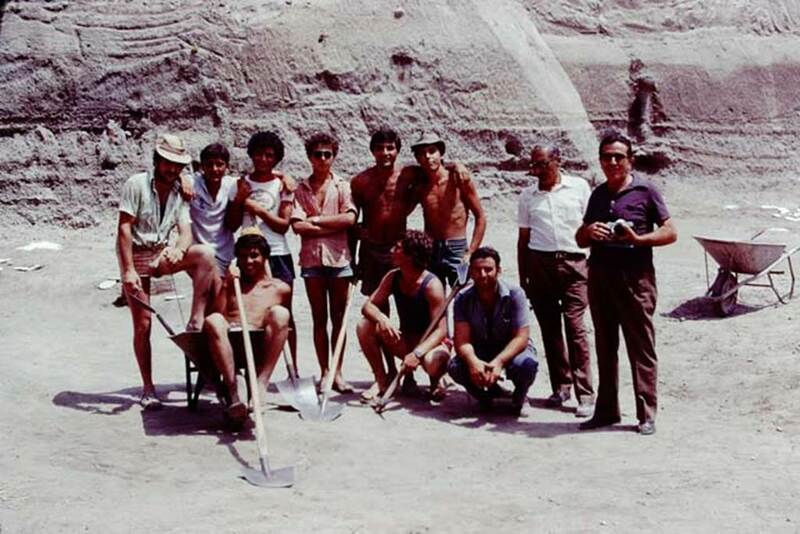 Oplontis Villa of Poppea, 1977. Re-attaching the painted plaster. Photo by Stanley A. Jashemski. 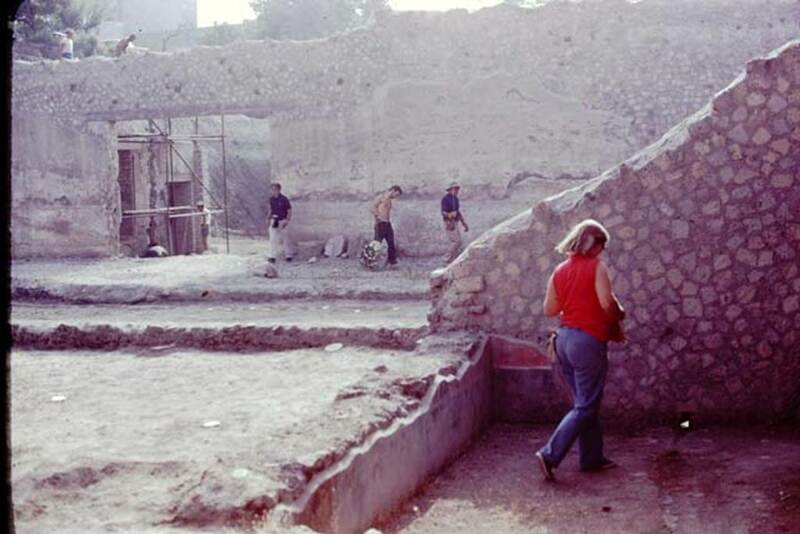 Oplontis Villa of Poppea, 1977. Room 88 front and room 87 at rear. Photo by Stanley A. Jashemski. 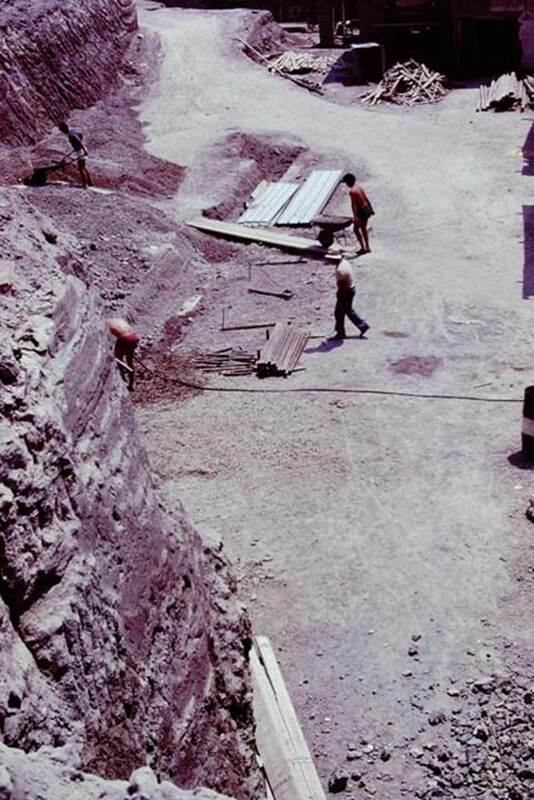 Looking down into room 87, during reconsolidation. Photo by Stanley A. Jashemski. Looking west into room 87, and across north garden, at its rear. Photo by Stanley A. Jashemski. 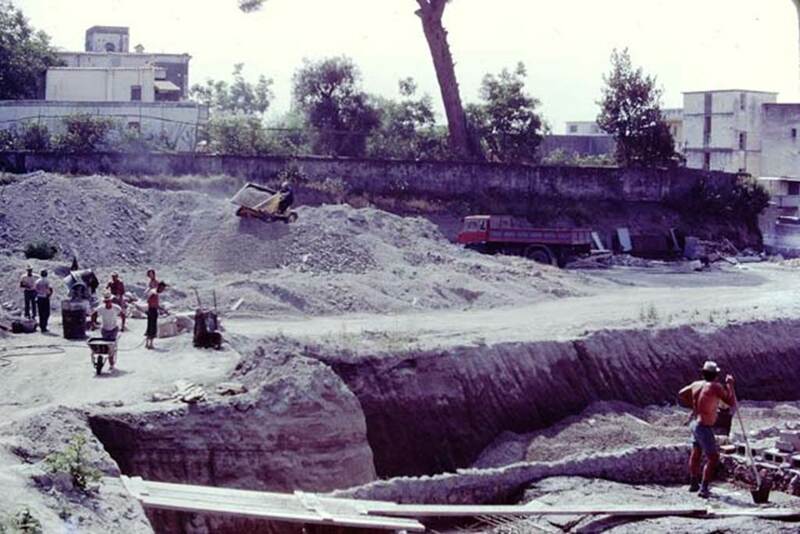 Oplontis Villa of Poppea, 1977. Looking west across room 69, towards north garden. Photo by Stanley A. Jashemski. 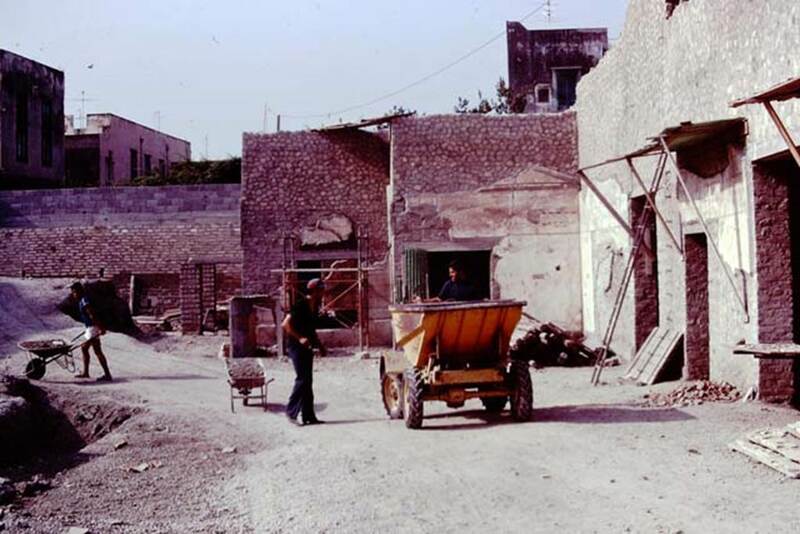 Oplontis Villa of Poppea, 1977. Reconstructing the villa roof. Photo by Stanley A. Jashemski. Oplontis Villa of Poppea, 1977. Looking east from above room 74, towards the still unexcavated area, above the pool. Area 56, looking towards south side of the east end of the north garden, on the right is the doorway to room 55, and corridor 52. 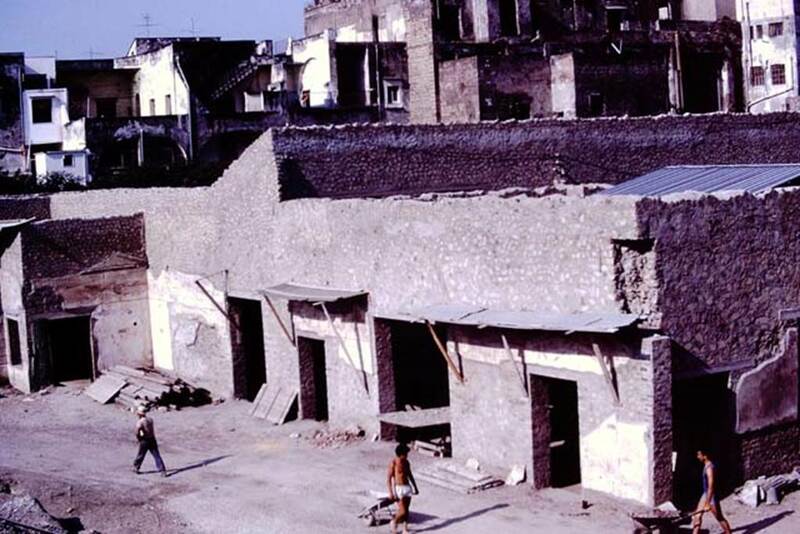 Oplontis Villa of Poppea, 1977. Looking north in north-east corner of north garden. Photo by Stanley A. Jashemski. 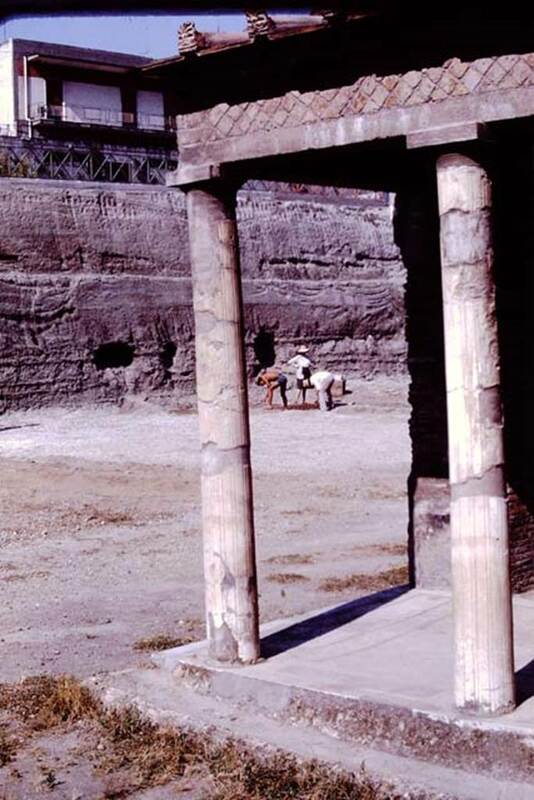 Oplontis Villa of Poppea, 1977. Looking north-west at north end of north (rear) garden. Photo by Stanley A. Jashemski. 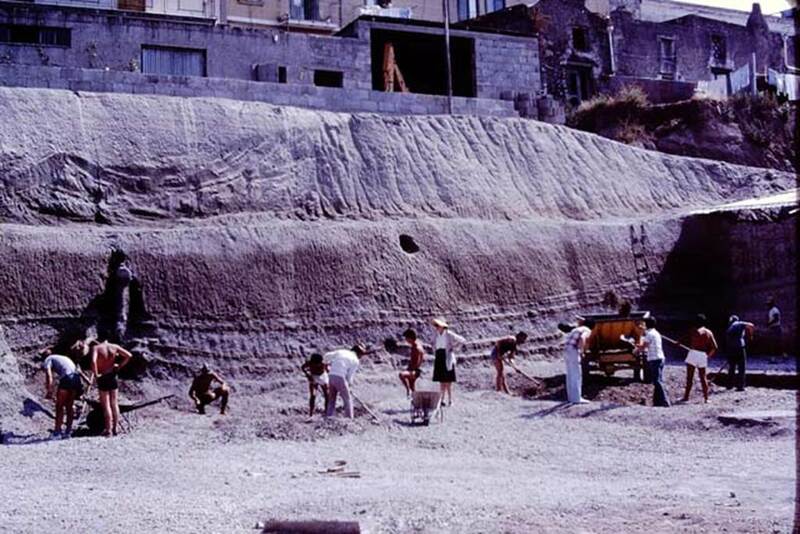 Oplontis Villa of Poppea, 1977. Looking east across north garden, towards doorway to room 69, in top right. At the bottom of the photo, a group of root-cavities have been discovered. Group of root-cavities covered by stones/slabs at north end of north garden. Photo by Stanley A. Jashemski. 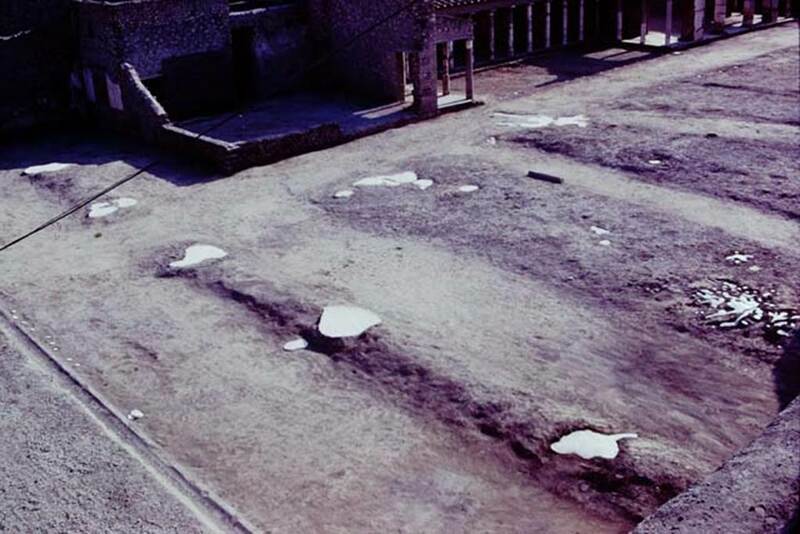 Oplontis Villa of Poppea, 1977. Area 56, looking east in north-east corner. The area has now been cleaned back to the original level, and the group of root-cavities found, lower part of photo. In the top-right of the photo is the white painted filled root-cavity of the fourth of the line of large trees. 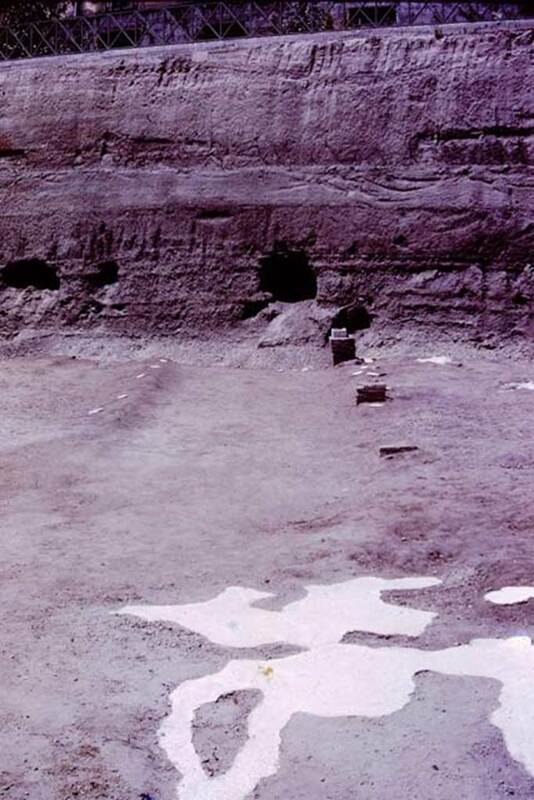 In the top-left of the photo, another root-cavity of a large tree has been discovered, still filled with its lapilli. Looking east along north side of the rear garden, towards large doorway of room 69 leading to the unexcavated pool. Photo by Stanley A. Jashemski. 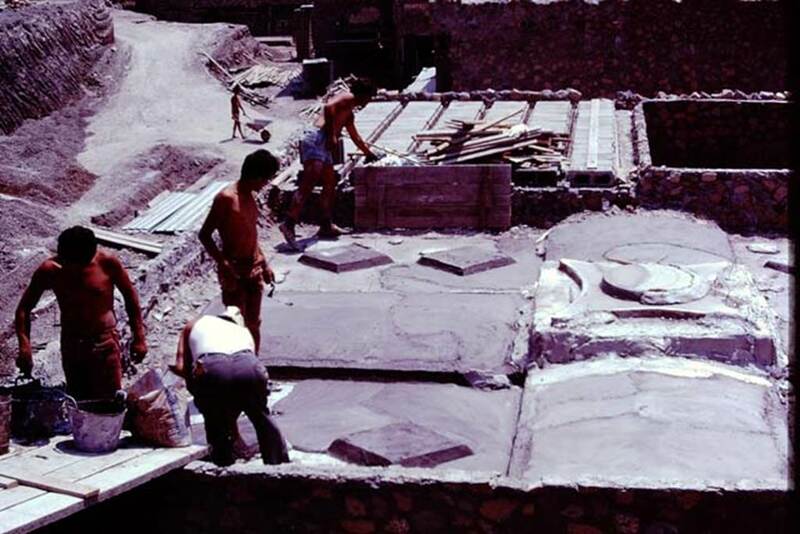 Oplontis Villa of Poppea, 1977. Looking towards room 21, towards the south-west end of north garden. Photo by Stanley A. Jashemski. 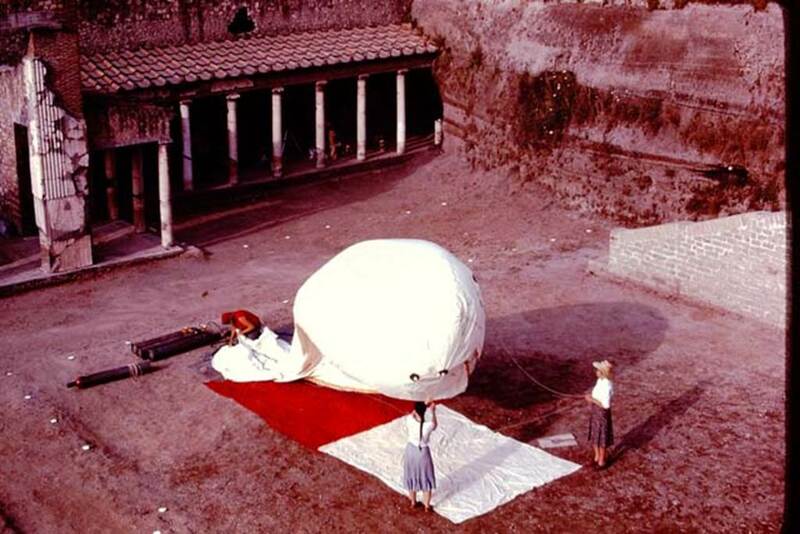 Oplontis Villa of Poppea, 1977. Looking towards west end of north garden. Photo by Stanley A. Jashemski. Looking from west portico, 33, towards north-east across rear garden. Photo by Stanley A. Jashemski. 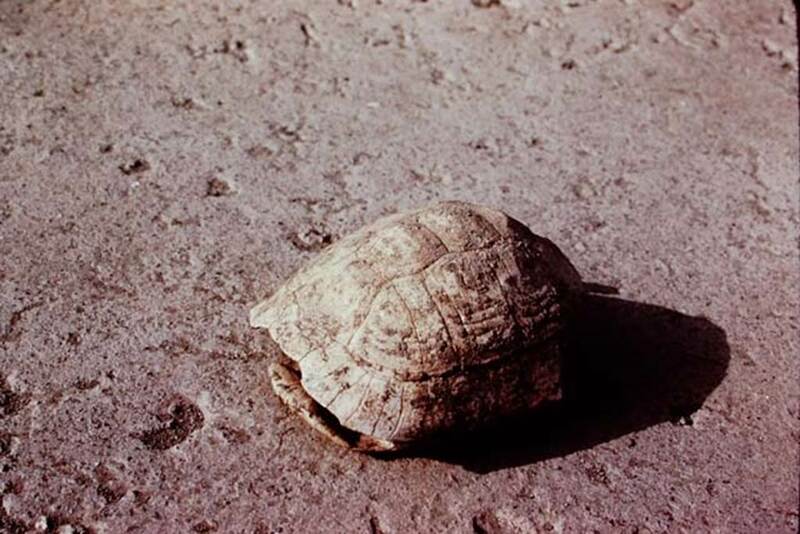 Oplontis Villa of Poppea, 1977. Area 33, lunch on the west portico. Photo by Stanley A. Jashemski. 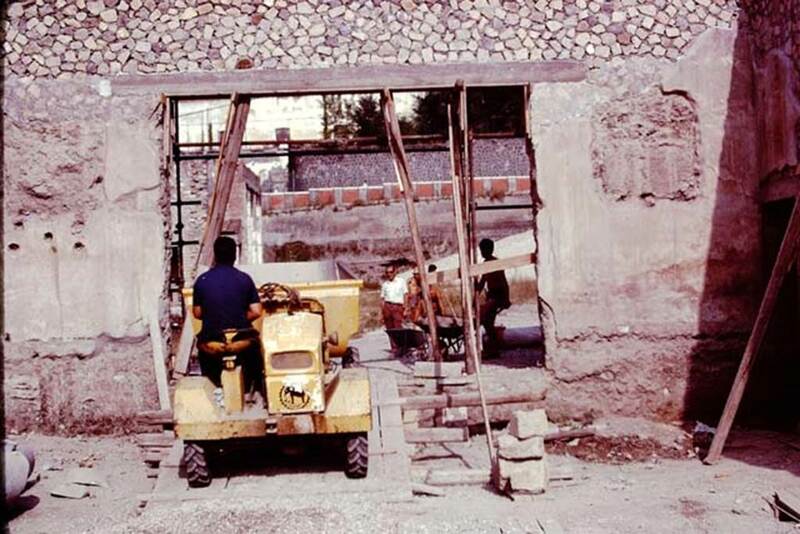 Oplontis Villa of Poppea, 1977. 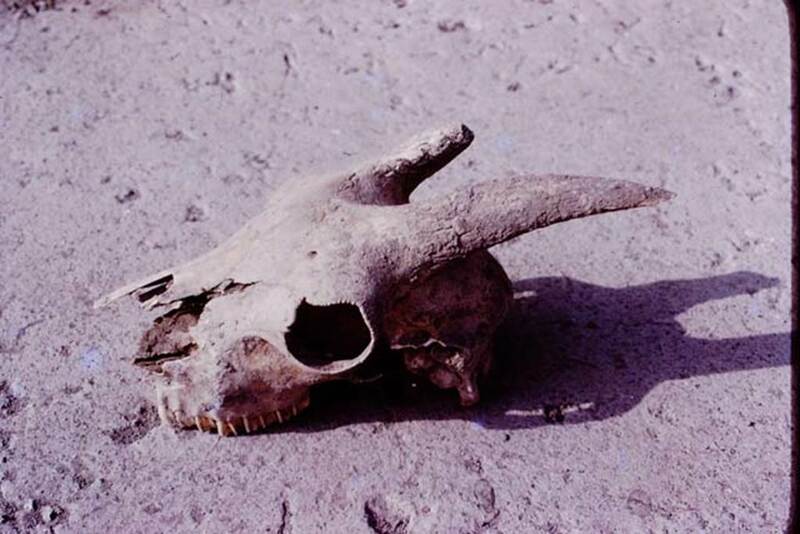 A goat’s skull was found near the large tree-root cavities. Photo by Stanley A. Jashemski. 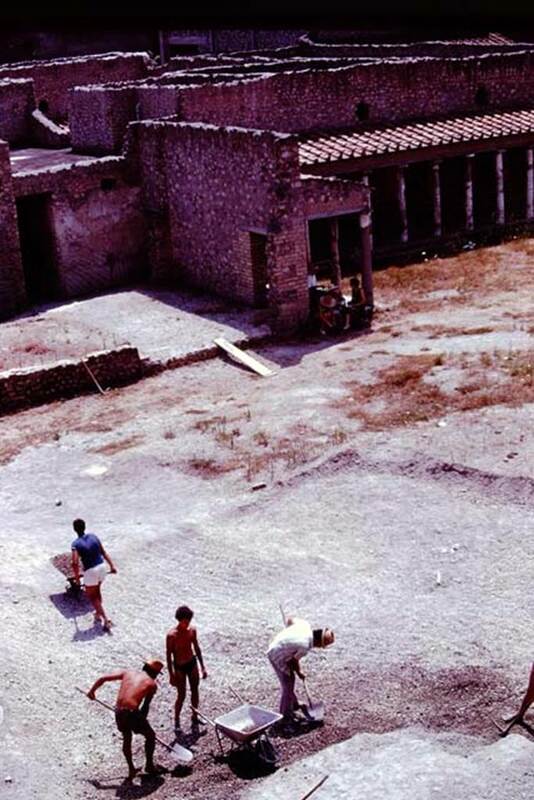 Oplontis Villa of Poppea, c.1977. 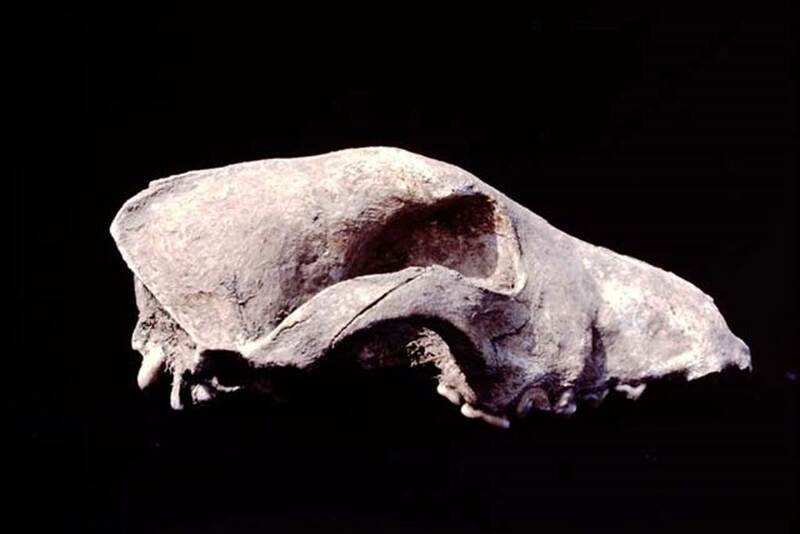 Skeleton of a dog’s skull which was found near the large tree-root cavities in the north garden. Shell of a turtle found near the large-tree root cavities in the north garden. Photo by Stanley A. Jashemski. Oplontis Villa of Poppea, 1977. 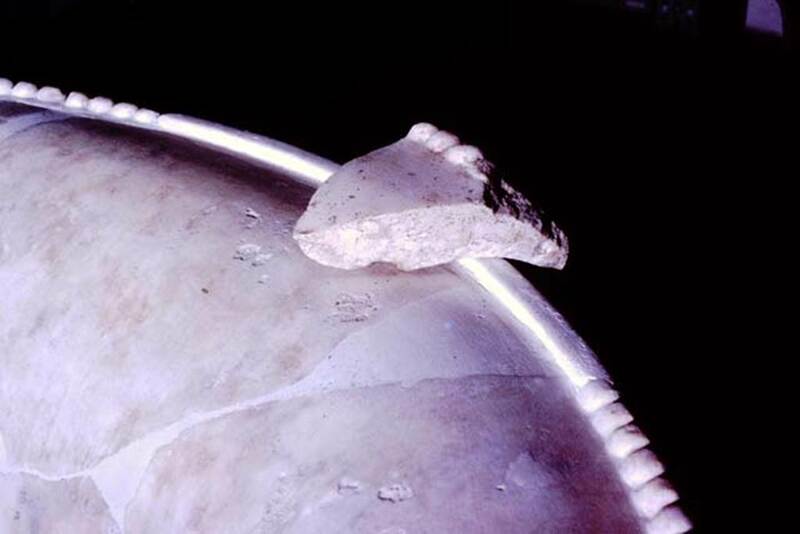 Large crater photographed standing on a capital, not its base (see 1978 photos). Oplontis Villa of Poppea, 1977. Fragment of crater. Photo by Stanley A. Jashemski. 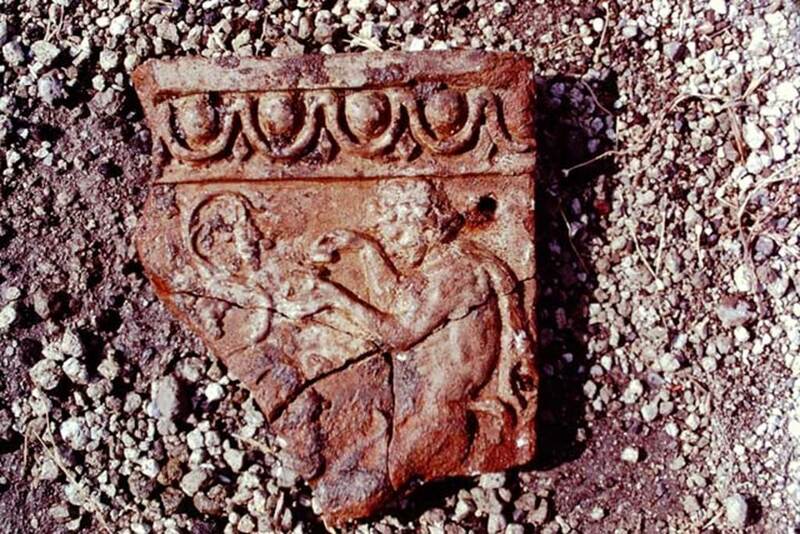 Fragment found, which would have fitted perfectly into the already restored rim. Photo by Stanley A. Jashemski. Oplontis Villa of Poppea, 1977. Looking south-east across east end of north garden. In this photo, the edge of the portico along the garden’s east side is being seached for root-cavities. Photo by Stanley A. Jashemski. 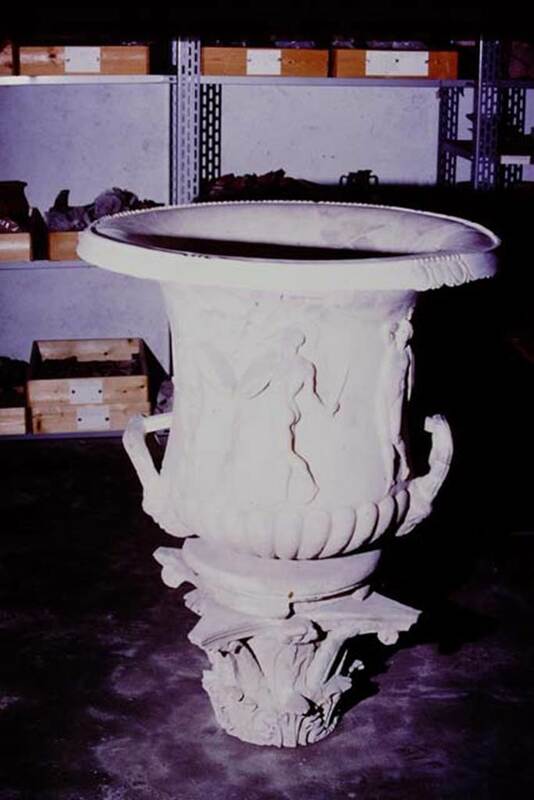 Oplontis Villa of Poppea, 1977. Looking south across east end of north garden. Photo by Stanley A. Jashemski. 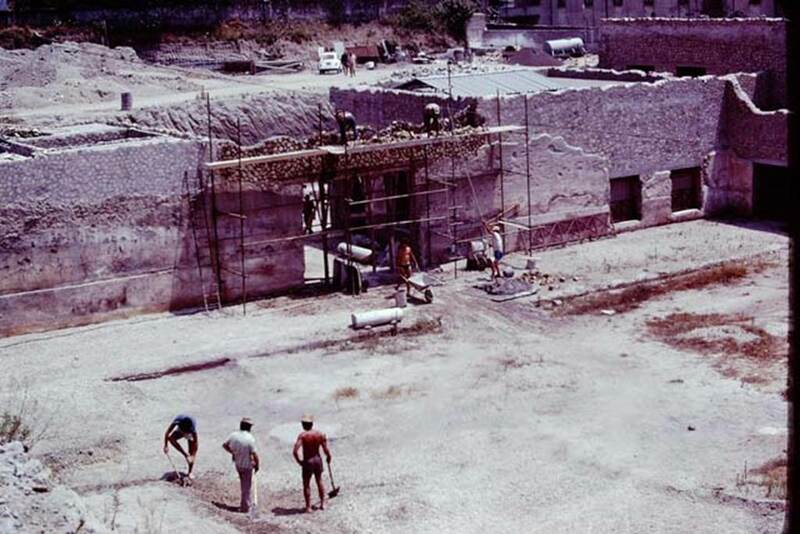 Oplontis Villa of Poppea, 1977. Area 56, cleaning up the area for the “balloon” photos. Photo by Stanley A. Jashemski. 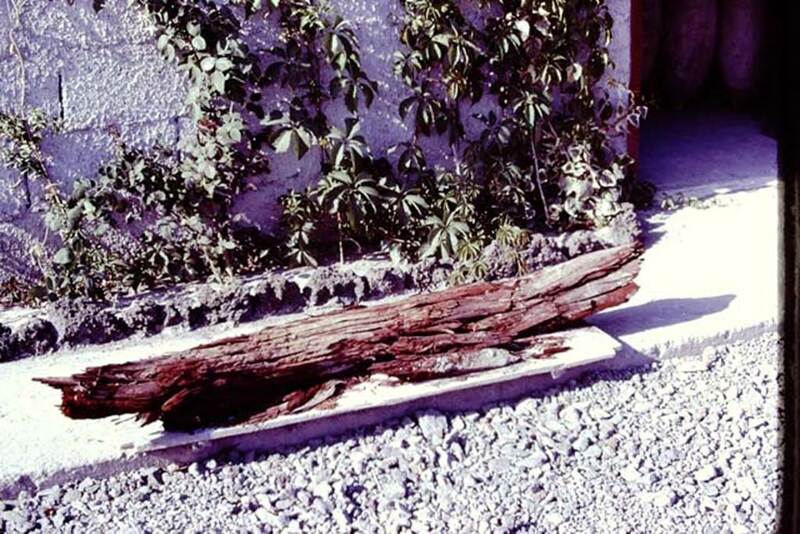 Along the edge of the gutter of the portico, small root-cavities can be seen covered with stones. 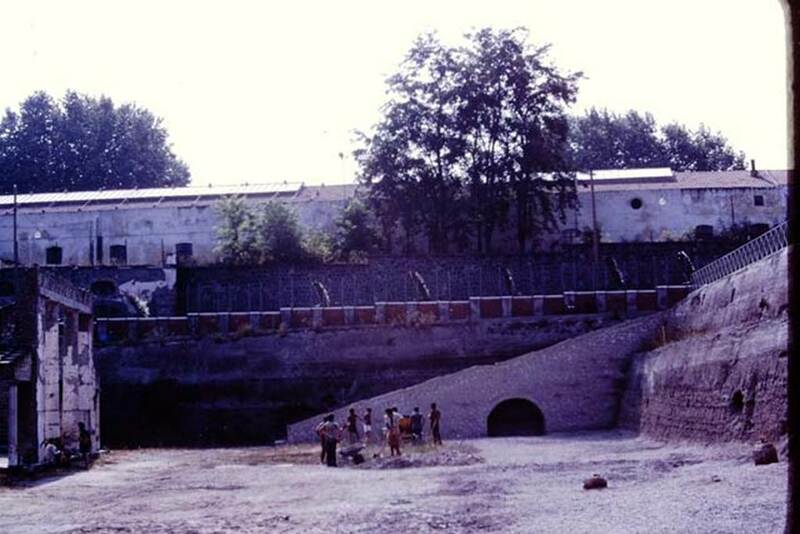 Oplontis Villa of Poppea, 1977. Filled large tree-root cavity being painted. Photo by Stanley A. Jashemski. Area 56, the north garden, looking east. Hard at work, cleaning and painting. Photo by Stanley A. Jashemski. 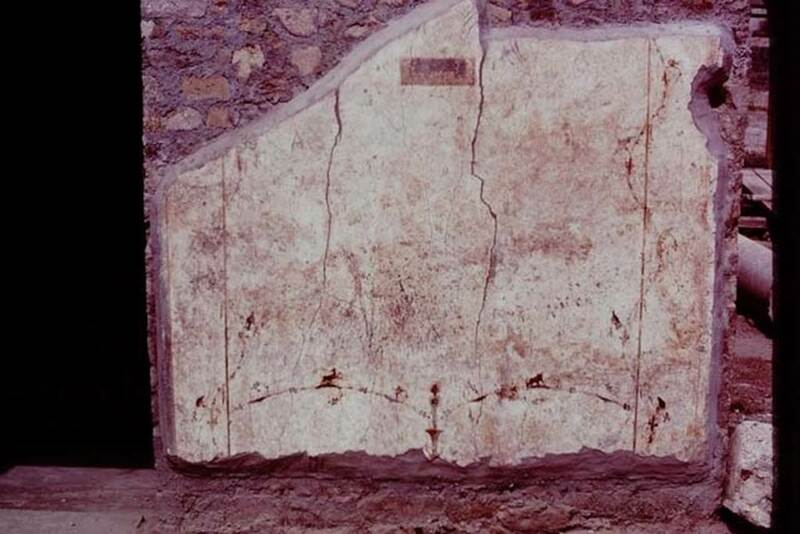 Oplontis Villa of Poppea, 1977. Cleaning and tidying the north garden, ready for the “balloon” photos. The root cavities are being painted white, to ensure they show up from the air. Photo by Stanley A. Jashemski. Area 56, the north garden. 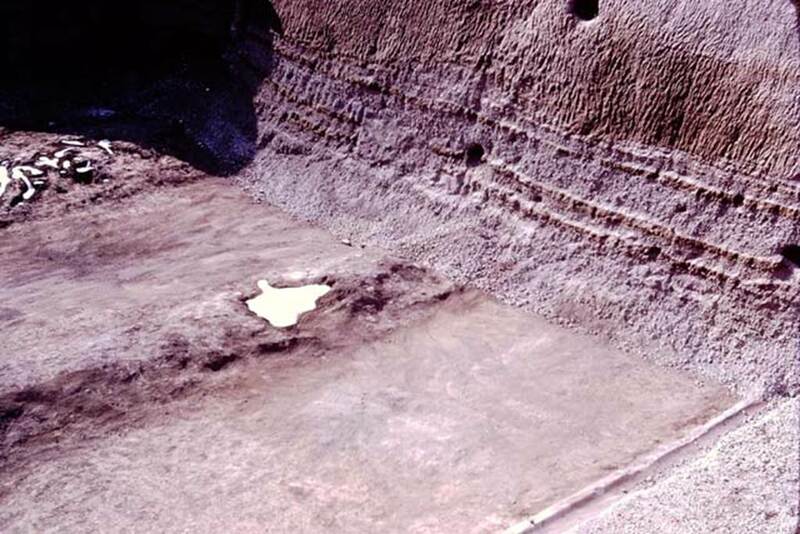 Looking west across the cleaned area, with root cavities painted white. Photo by Stanley A. Jashemski. 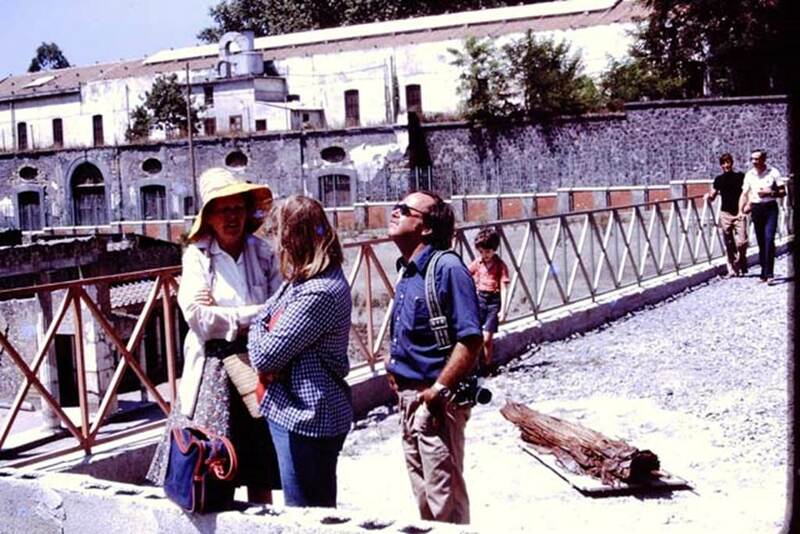 Oplontis Villa of Poppea, 1977. The balloon being filled, which would be used to photograph from the air. Looking south-west towards the west portico, the rows of root cavity can be seen cleanly painted white. Room 57, looking east towards the remains of black and red painted plaster on the wall. Photo by Stanley A. Jashemski. On the left is room 58, with its root cavities, on the right is room 57 with its remaining black and red painted plaster. Looking east. At the rear, across the garden, is the doorway to room 69. Photo by Stanley A. Jashemski. 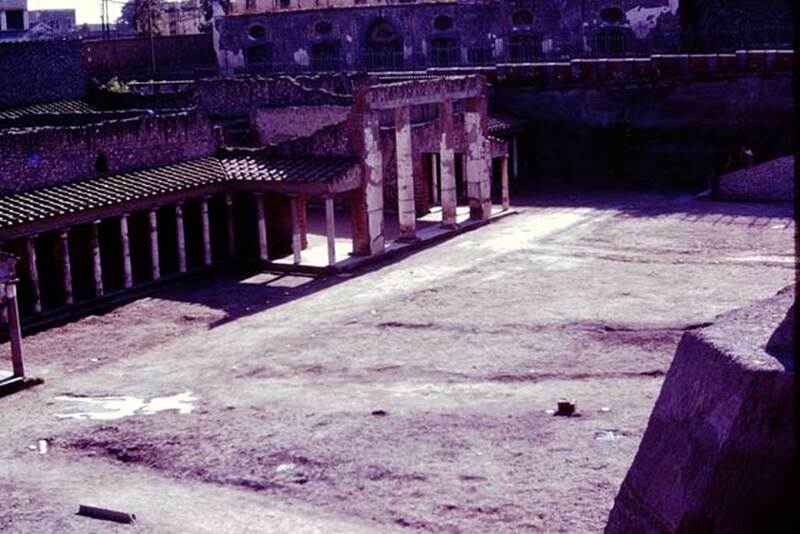 Oplontis Villa of Poppea, 1977. Looking south across north garden, towards east portico 34. 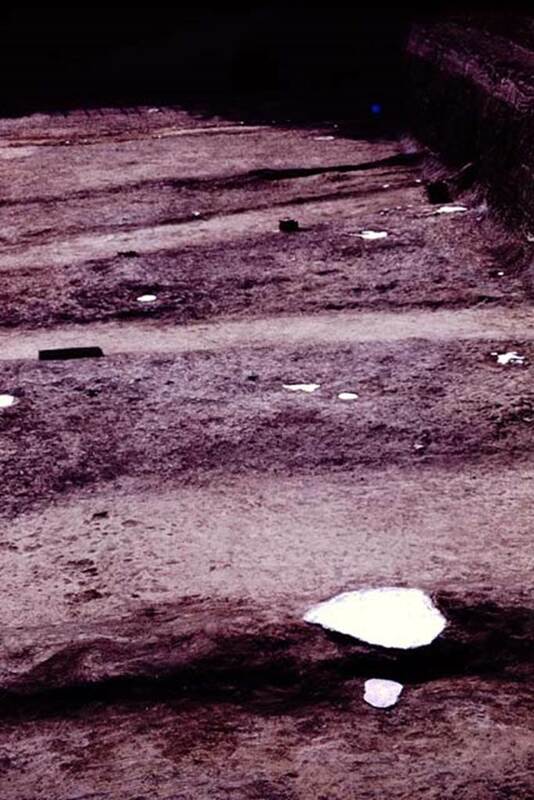 The line of white painted root cavities bordered the east-west path along the rear of the villa. Photo by Stanley A. Jashemski. 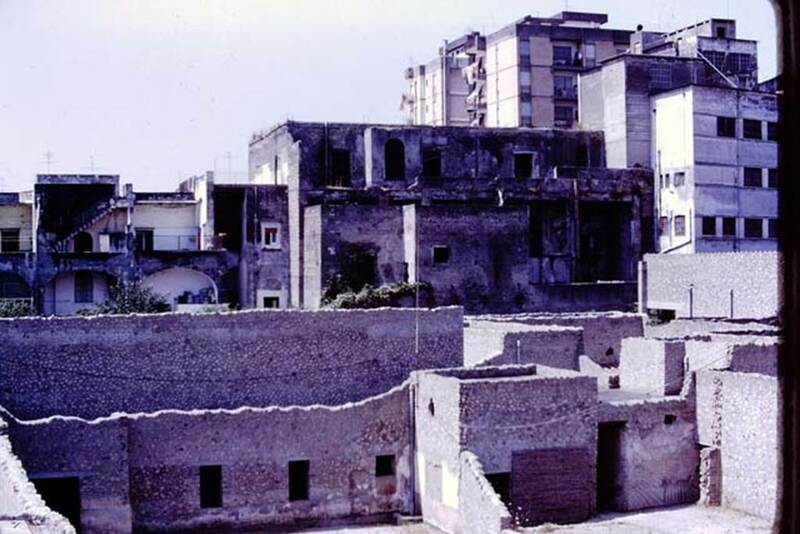 Oplontis Villa of Poppea, c.1977. Looking east across north garden, along west-east pathway at the rear of the villa. On the right is the large entrance to room 21. 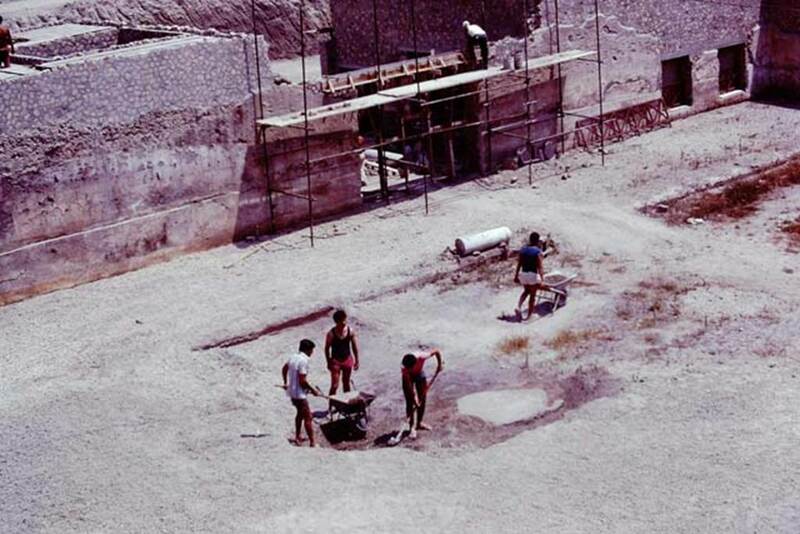 Oplontis Villa of Poppea, 1977. Group photo of the workers. Photo by Stanley A. Jashemski. Area 56, east end of north garden, clearly showing line of five huge tree-root cavities and smaller cavities bordering the portico. 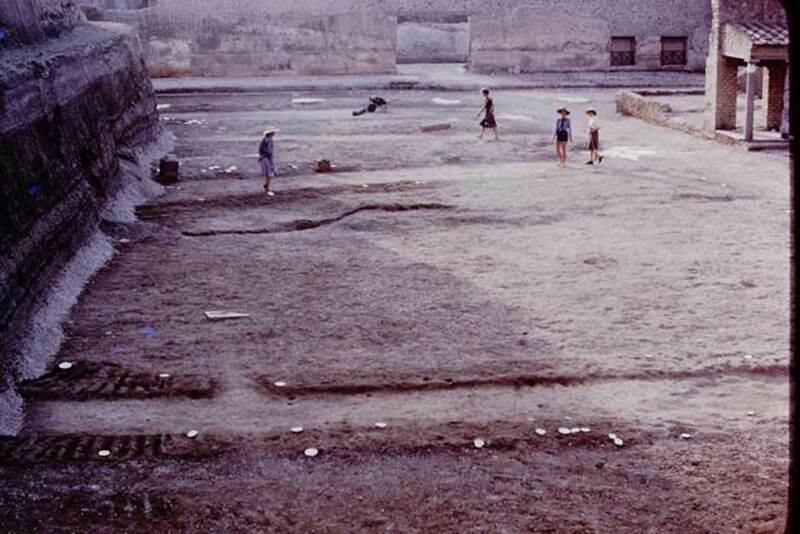 Oplontis Villa of Poppea, 1977. Looking north-west towards the balloon flying above north garden. In the centre under the balloon is the doorway from room 69. On the right of doorway 69, is a doorway to room 71, the window into room 70 a small courtyard garden, and doorway to room 72. Looking north from room 21, along the central pathway across north garden towards the unexcavated. 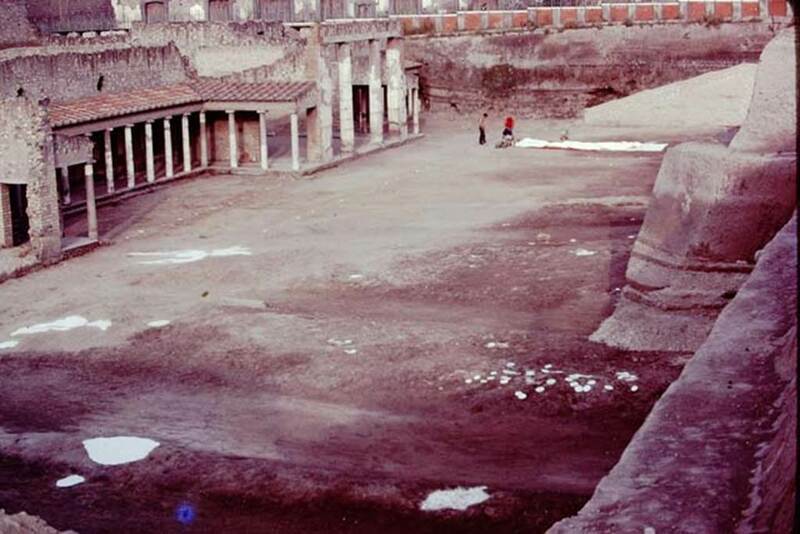 Oplontis Villa of Poppea, 1977. Looking north along central path, towards unexcavated north garden. (The large branch of the tree, which Wilhelmina mentions below, was found in the cavity on the left, which seems to be surrounded by white lapilli). 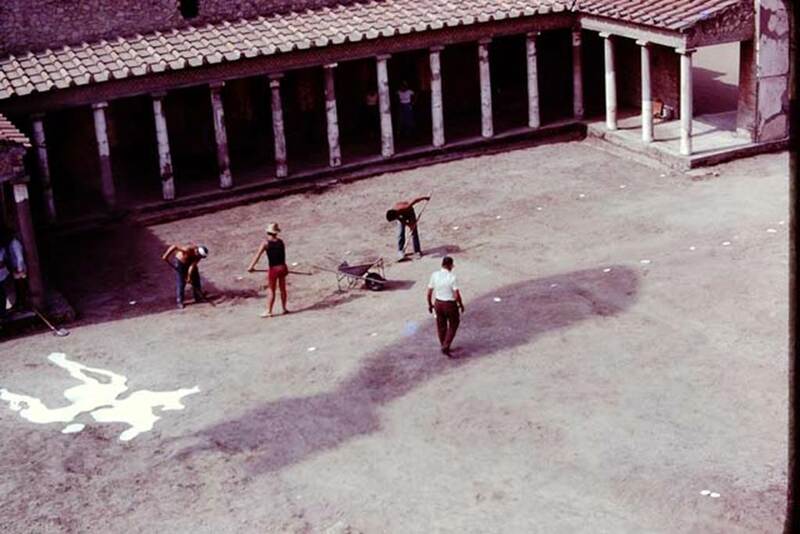 Oplontis Villa of Poppea, 1977. Looking east across north garden. 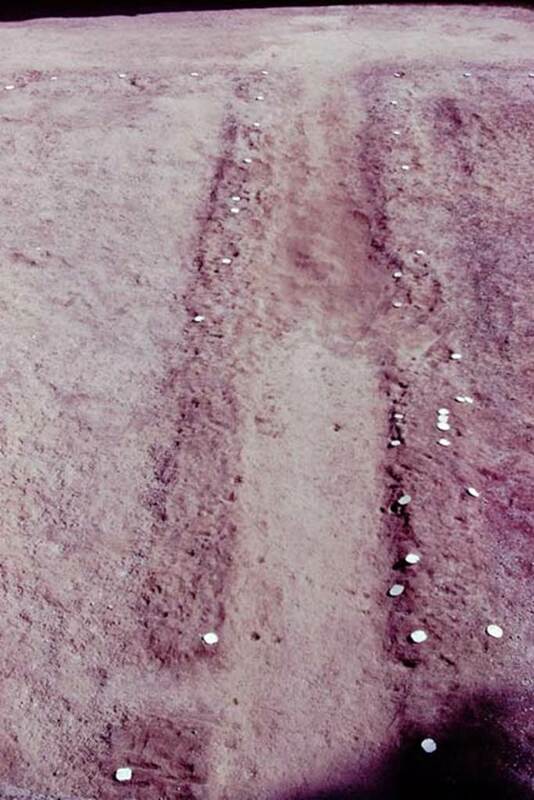 The central path, with its white painted root cavities, is shown in the lower part of the photo. The diagonal path, which most probably joined to the central one, can be seen with the three figures walking along it. 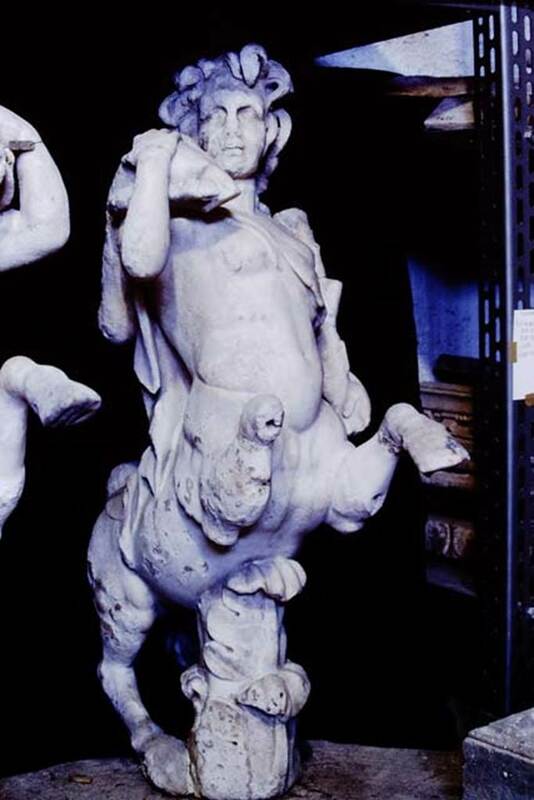 According to Wilhelmina, “We discovered, flanking the central passageway, the bases and three tiny fragments of three of the four marble centaur fountains that had been found stored in the rear east portico, facing the garden. 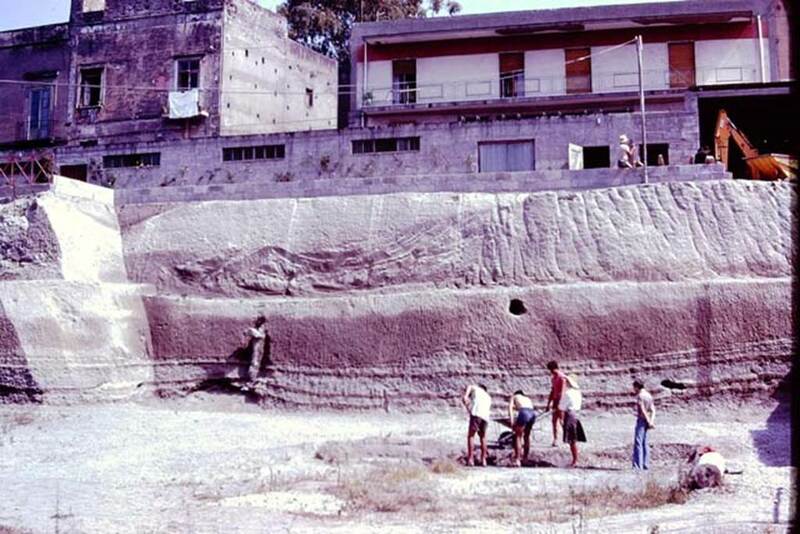 Oplontis Villa of Poppea, 1977. 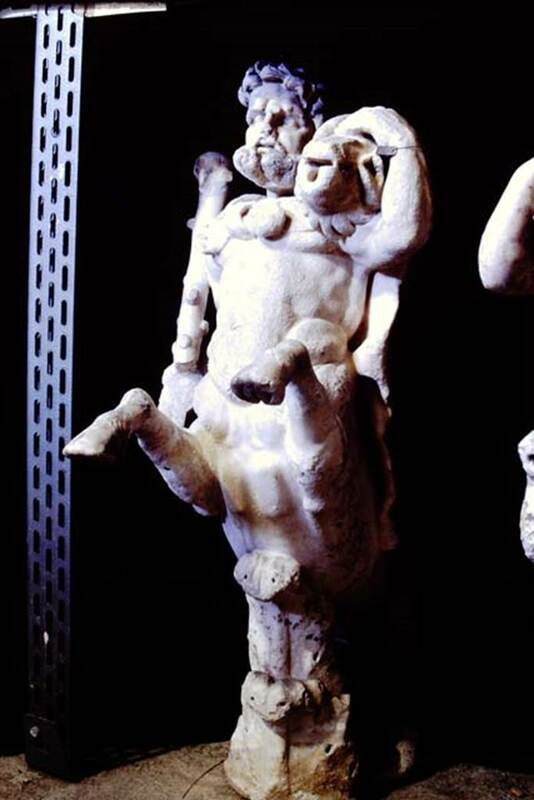 One of a group of four centaurs, a male holding a club with a small boar on his shoulder. Two centaur fountains had been on each side of the passageway. There was no evidence of pipes, so they had not been used as fountains in their final location. 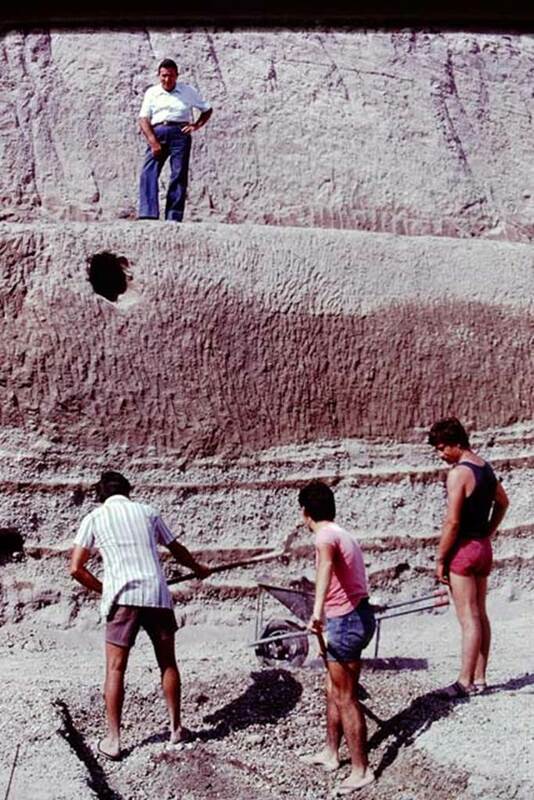 According to De Caro, a group of four centaurs were found under portico 33 on 17th February 1970. When they were found, they were very badly damaged. Heads and limbs were mostly detached and it was necessary to provide patient and pain-staking work of re-composition. 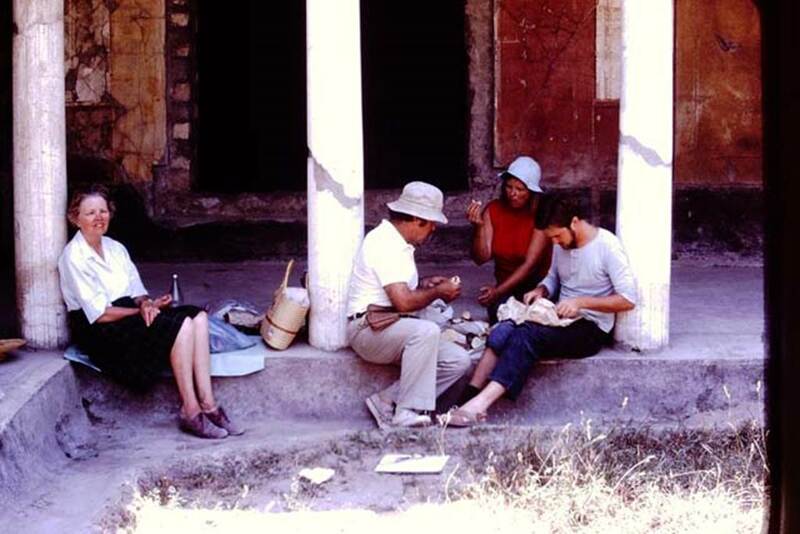 Oplontis Villa of Poppea, 1977. 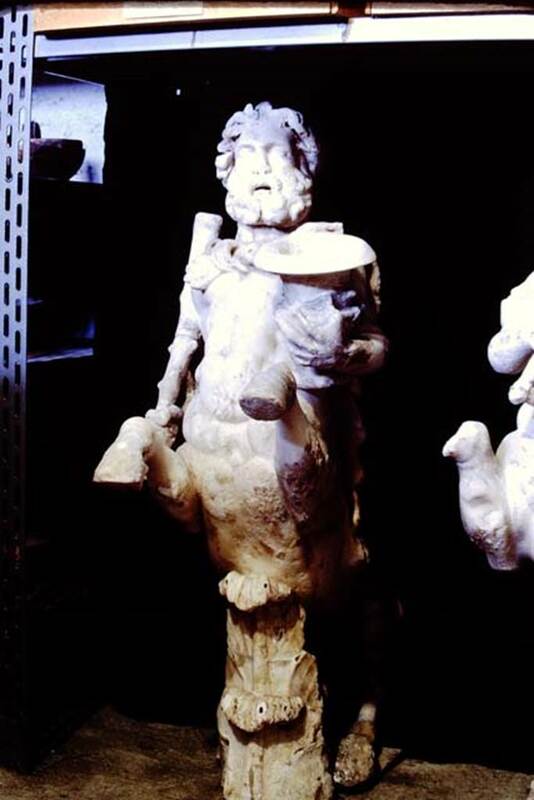 One of a group of four centaurs, a male holding a club and a crater. 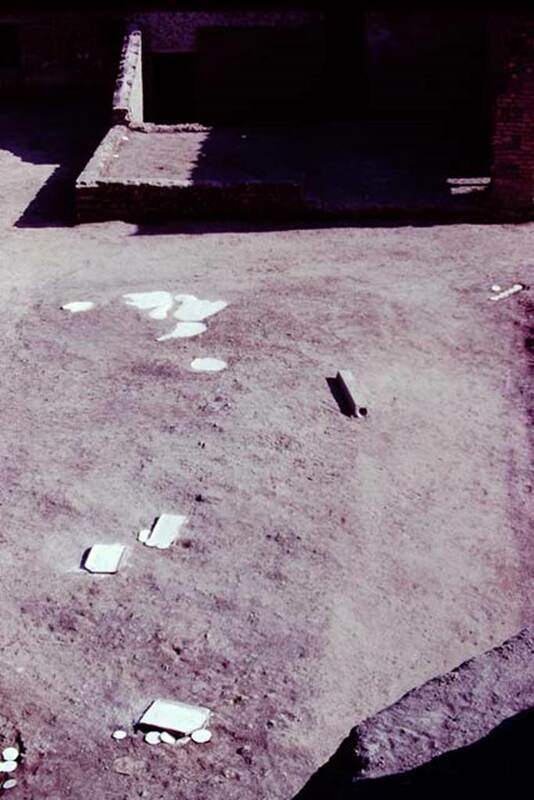 Oplontis Villa of Poppea, 1977. One of a group of four centaurs, a female holding a club and a lyre. 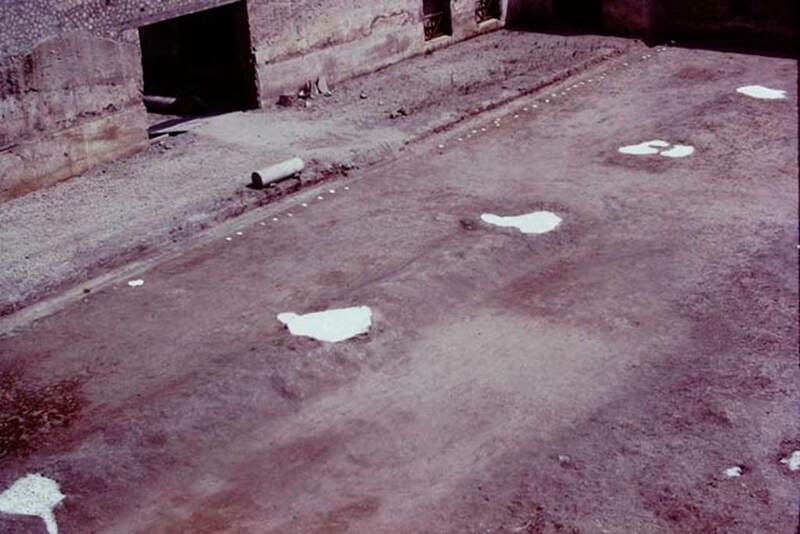 Oplontis Villa of Poppea, 1977. 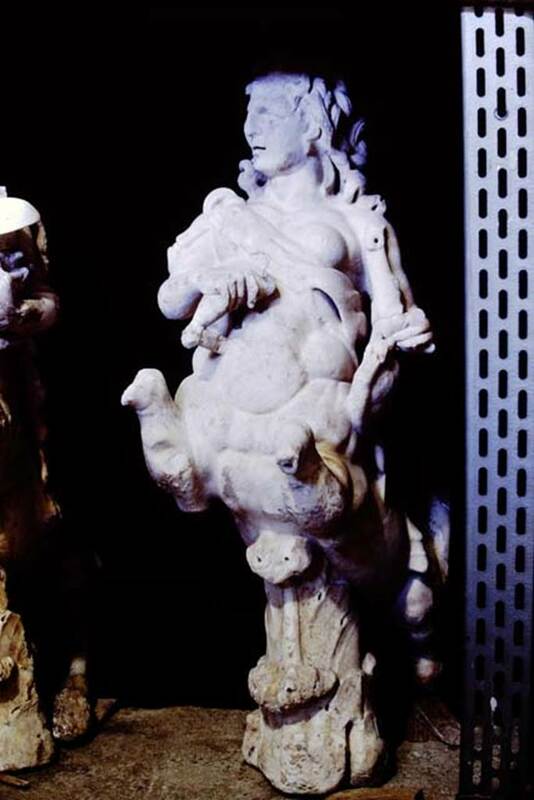 One of a group of four centaurs, a female holding a club and a fawn on her shoulder. When they were found, they were very badly damaged. Heads and limbs were mostly detached, and it was necessary to provide patient and pain-staking work of re-composition. 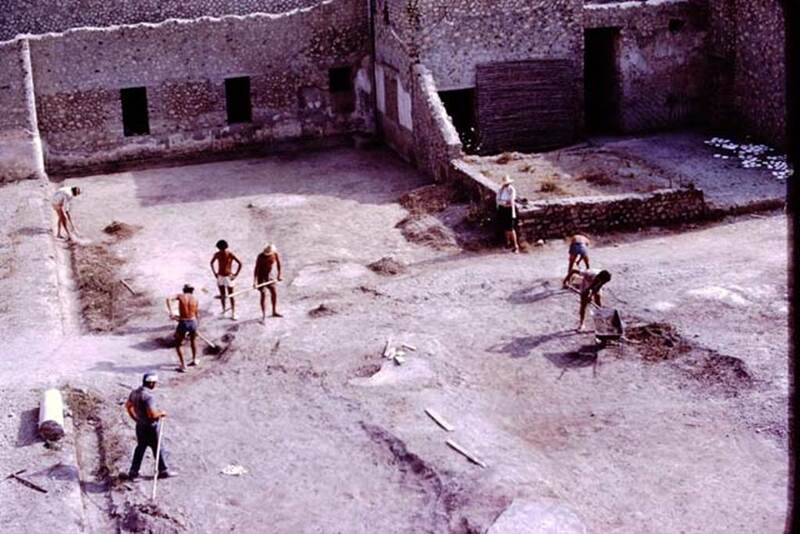 Oplontis Villa of Poppea, 1977. 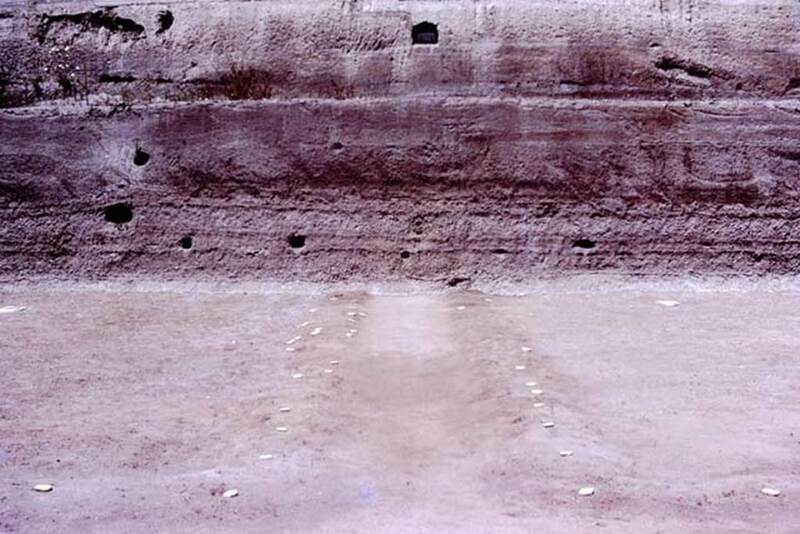 Looking north into the unexcavated, at the end of the central pathway from room 21. Looking from north end of central path, leading to centre of room 21. Photo by Stanley A. Jashemski. 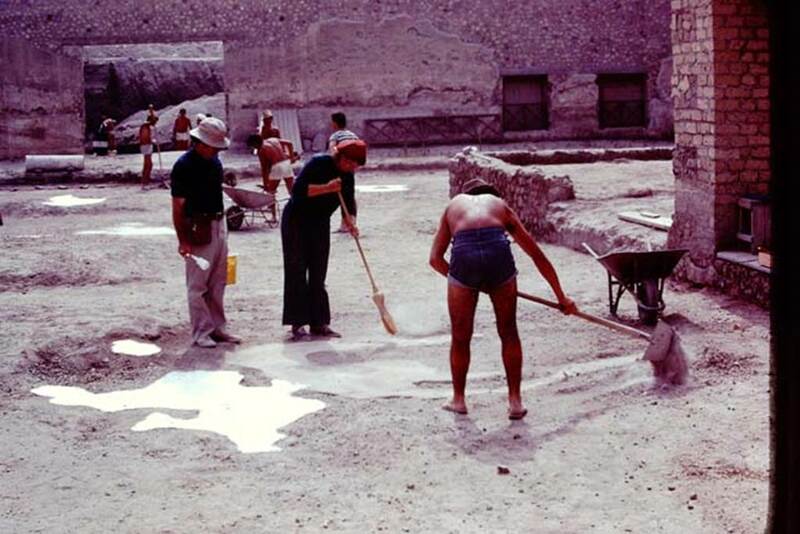 Oplontis Villa of Poppea, 1977. Wilhelmina on the north side of the villa. On the floor is the tree-branch found in the lapilli. 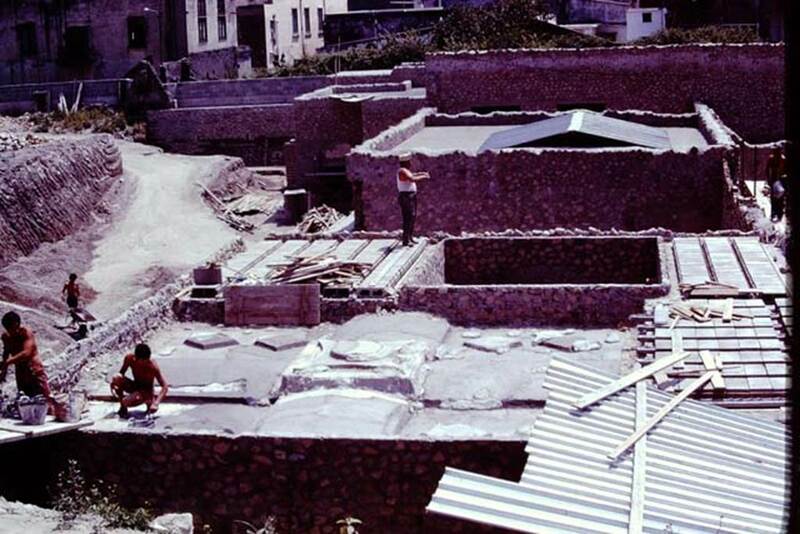 Oplontis Villa of Poppea, 1977. Tree-branch found in the lapilli. Photo by Stanley A. Jashemski. 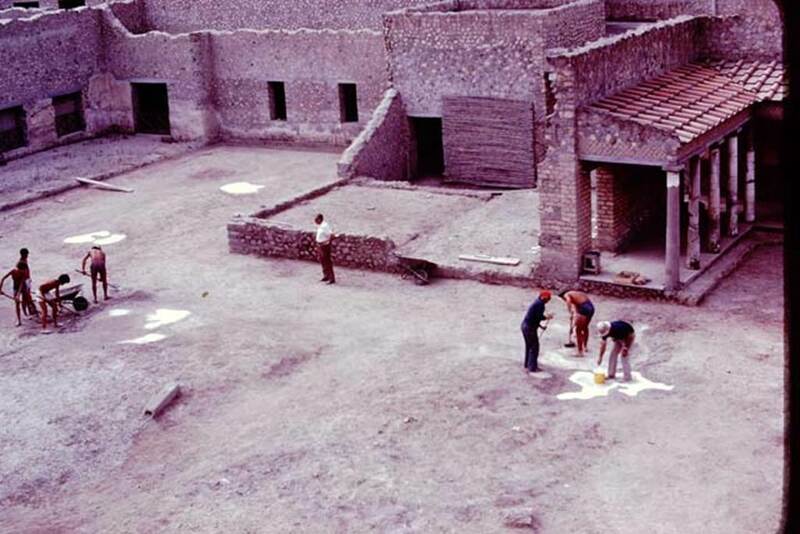 Oplontis Villa of Poppea, 1977. Branch of tree discovered in the lapilli. Photo by Stanley A. Jashemski. 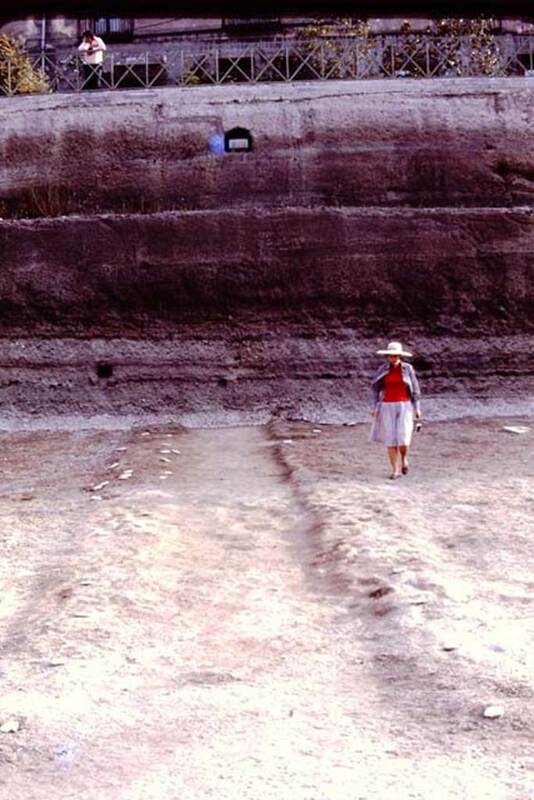 According to Wilhelmina: “Most spectacular was the large branch (about six feet long) of a tree found in the volcanic fill, at a height of about eight feet, at the north edge of our excavations. 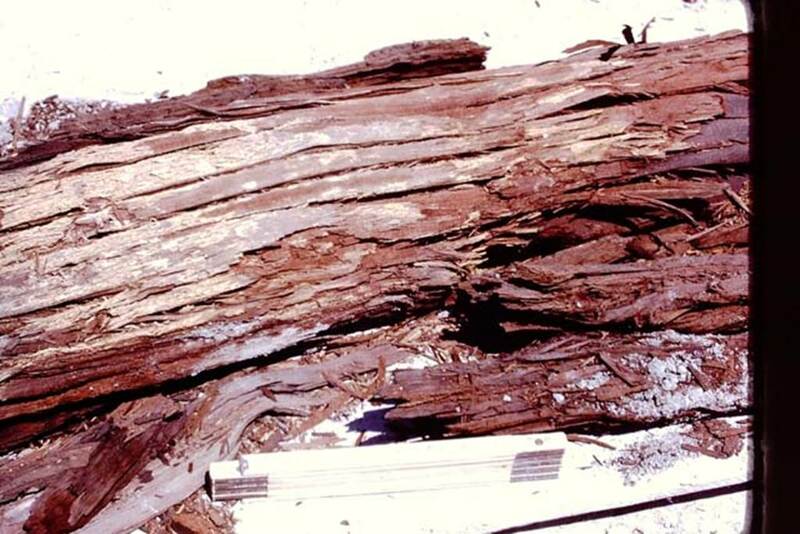 It had the appearance of fresh wood, and hopefully could be easily identified, but it was found that the cellular structure had been almost entirely destroyed. Fortunately a few cells were preserved, and it was discovered the large tree was an olive. 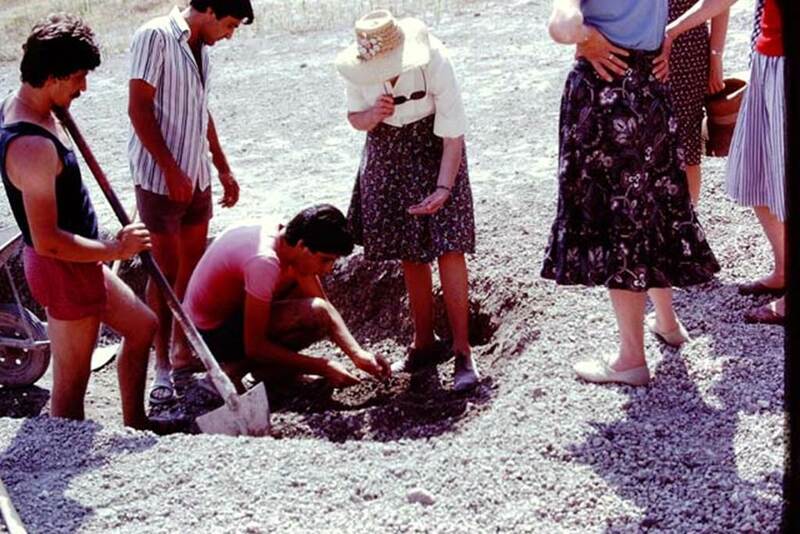 The cavities left by the spreading branches of the huge tree, which grew in the still unexcavated part of the garden (as well as the branches of other large trees, which may have been part of a row of olives) could be seen in the volcanic fill. 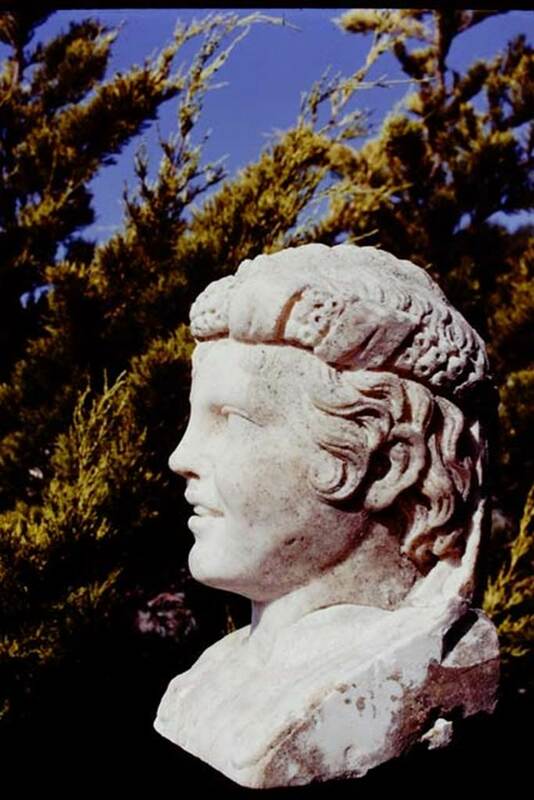 Oplontis Villa of Poppea, 1977. Looking north-west in the north garden. 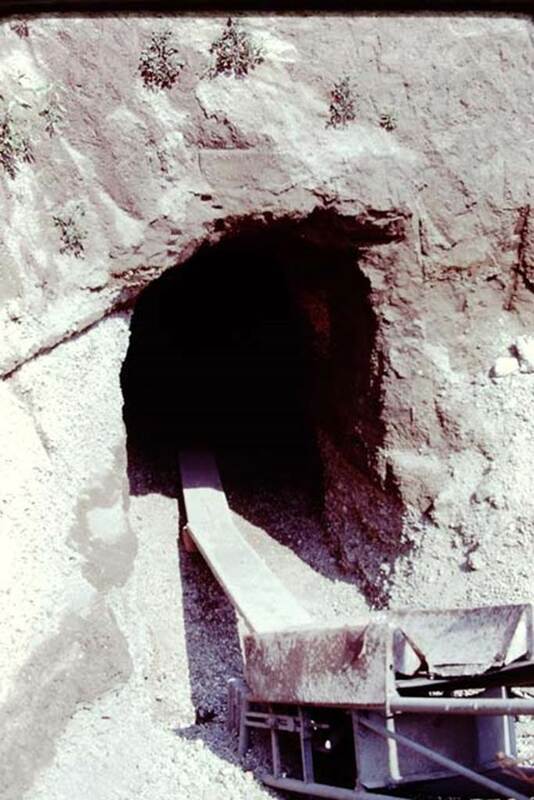 Looking from the huge root cavity found in 1974, which took 230 large buckets of cement to fill in 1975, along the diagonal line of a pathway, with bases. 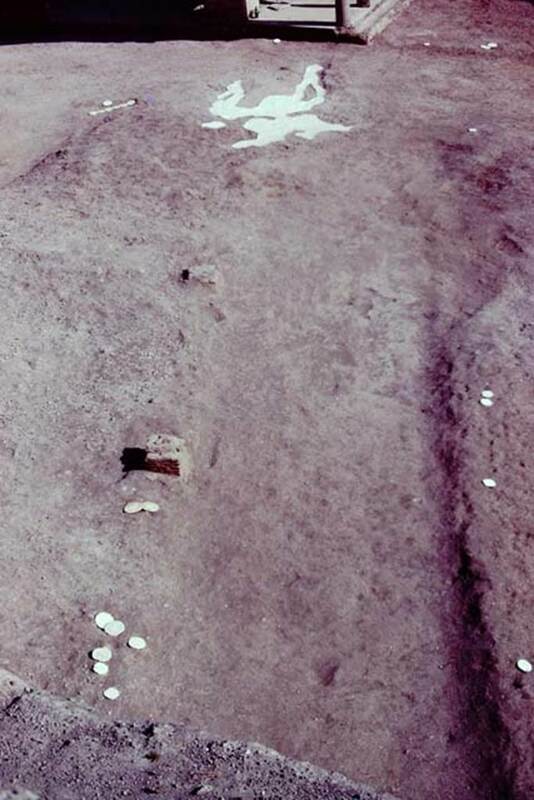 Wilhelmina thought the diagonal pathway probably joined with the central pathway leading out from room 21, although this could not be proved as the meeting point of the paths would be under the still unexcavated area. 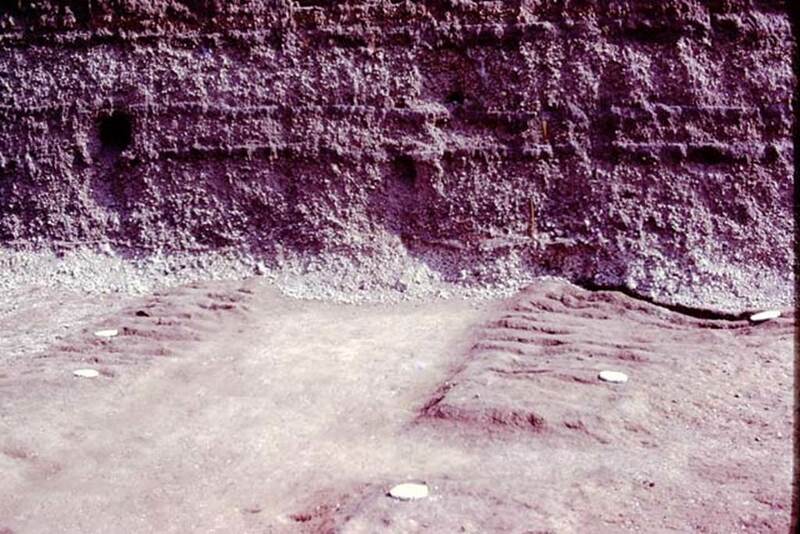 According to Wilhelmina, “At the edge of the diagonal passageway on the east, four masonry statue bases were found. 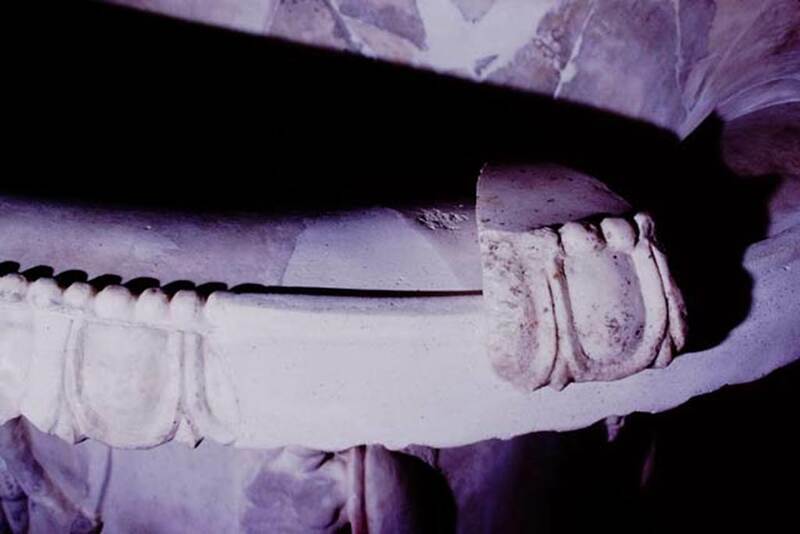 On them the marble shafts that supported the sculptured white marble heads had been mounted. 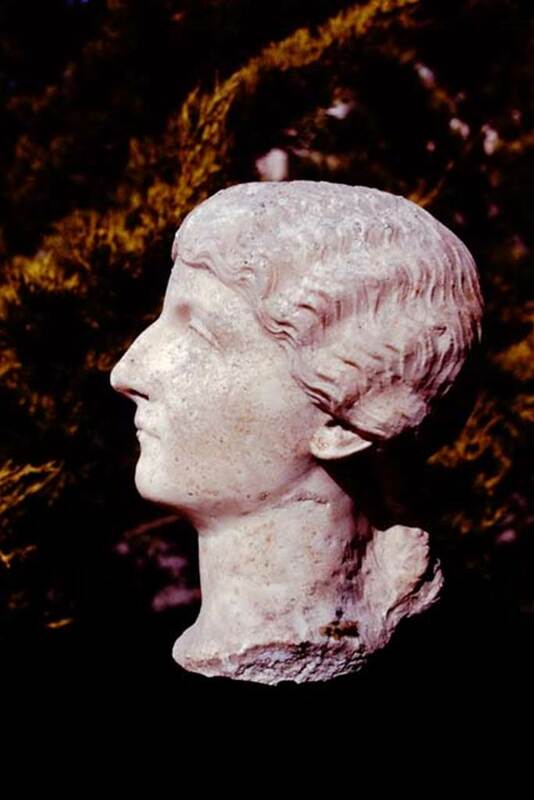 In 1975, we had found the portrait head of a woman of the Julio-Claudian period. 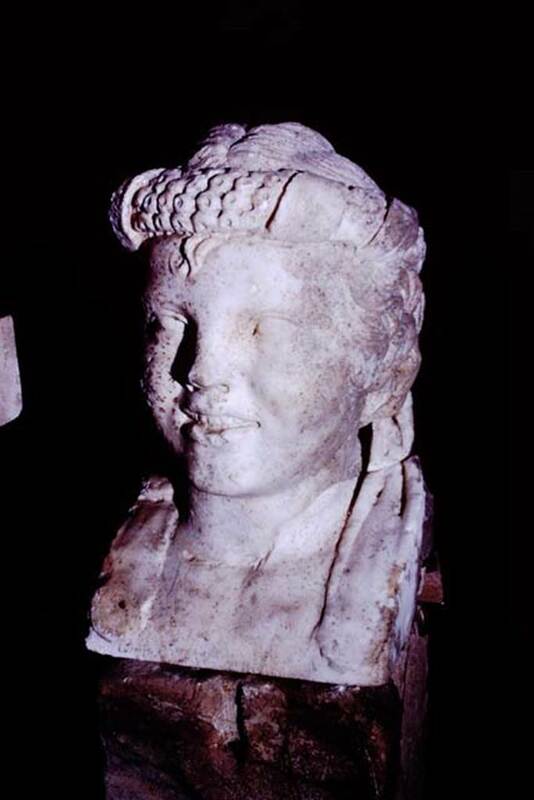 In addition, the Italian excavators had found the head of the goddess Aphrodite, the child Dionysus and the fine head of a Julio-Claudian boy, which some claimed was most certainly the child Nero. These herms, which would have been set in the middle of clumps of plants, mainly oleanders, reminded us of the garden paintings that showed sculpture set amid masses of flowering oleanders. Only the shaft of one other herm was found, and a few details of the hair still on the shaft were sufficient for Stefano De Caro to identify the missing head as that of a bearded archaic-type Dionysus. 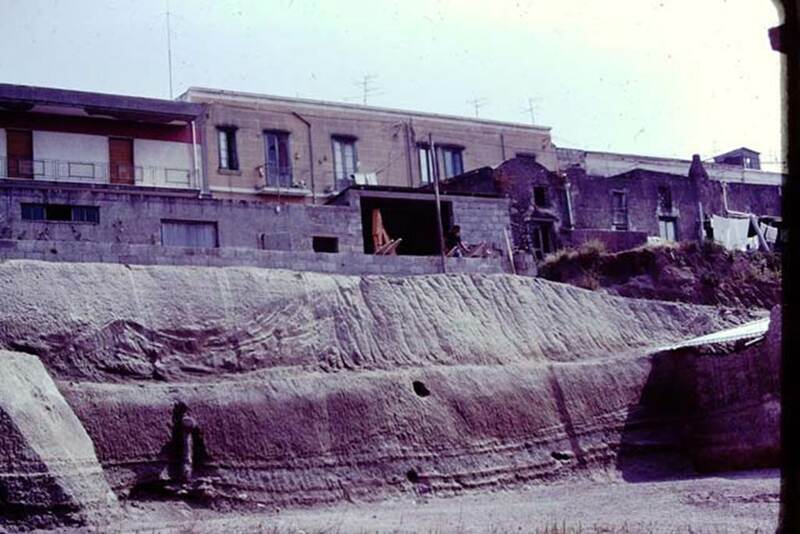 Oplontis Villa of Poppea, c.1977. Looking south-east along diagonal path in the north garden, towards large root-cavity and east portico 34. 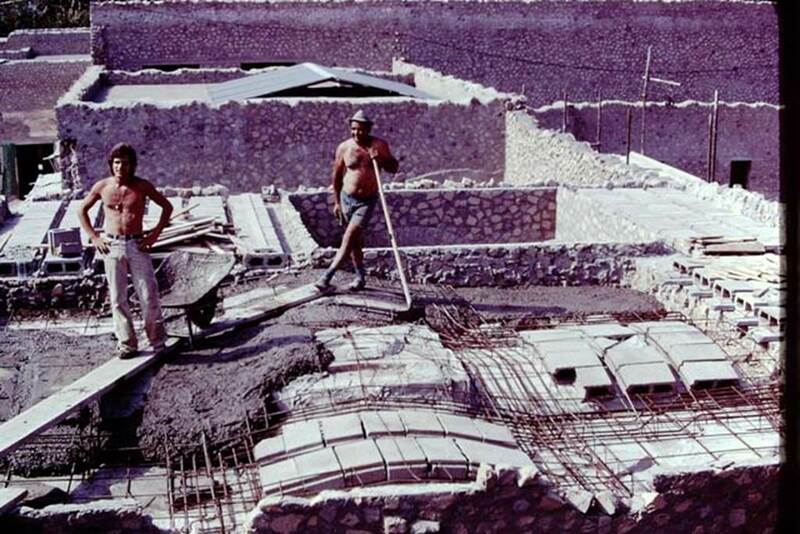 Oplontis Villa of Poppea, 1975. 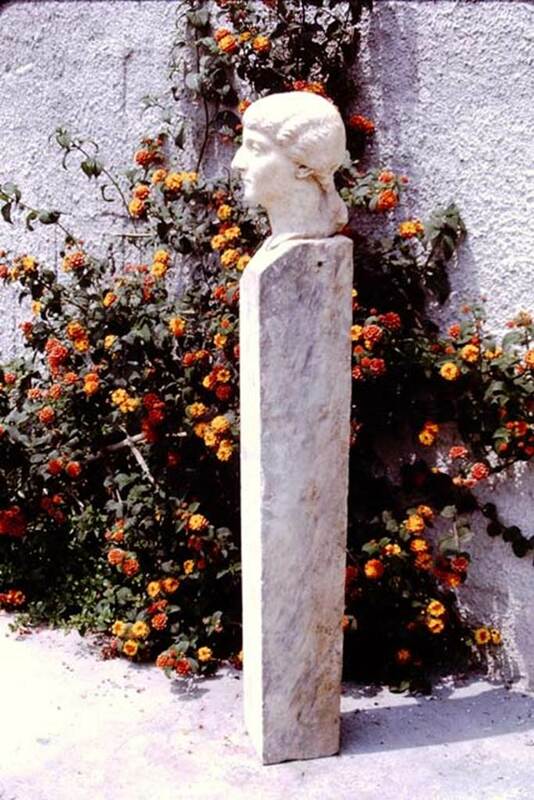 Beautiful marble head and shaft found in the north garden. Photo by Stanley A. Jashemski. 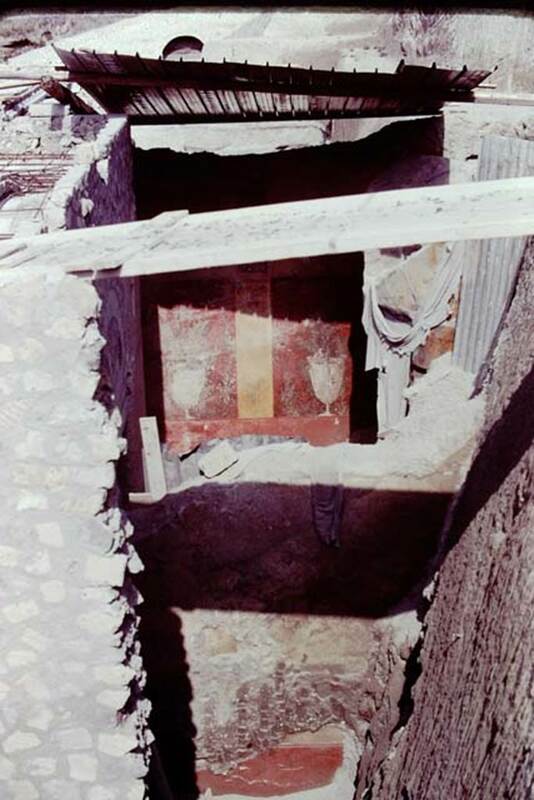 Oplontis Villa of Poppea, 1978. Marble portrait head of a woman found along the passageway. Photo by Stanley A. Jashemski. 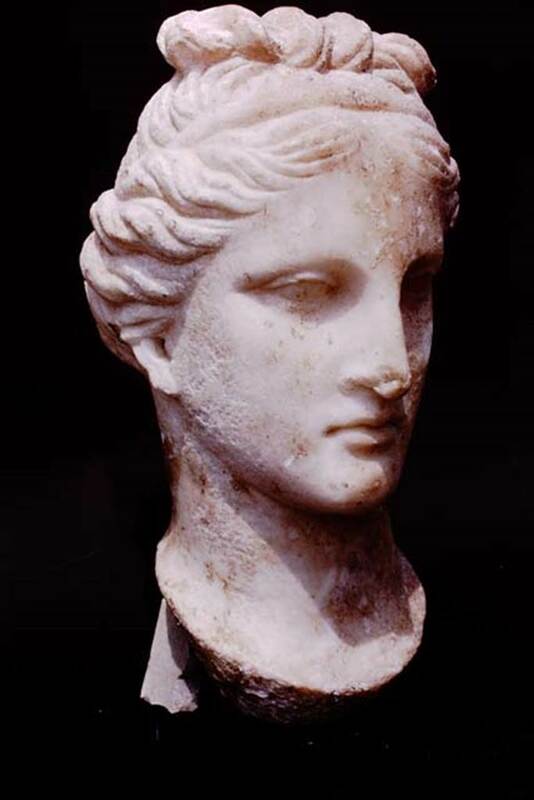 Marble head of a woman found along passageway. Photo by Stanley A. Jashemski. 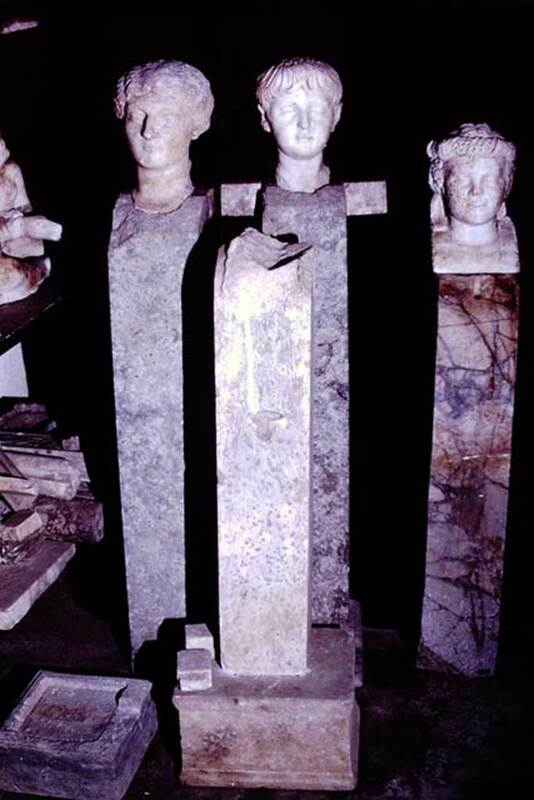 Marble heads, herms and statue bases. Photo by Stanley A. Jashemski. 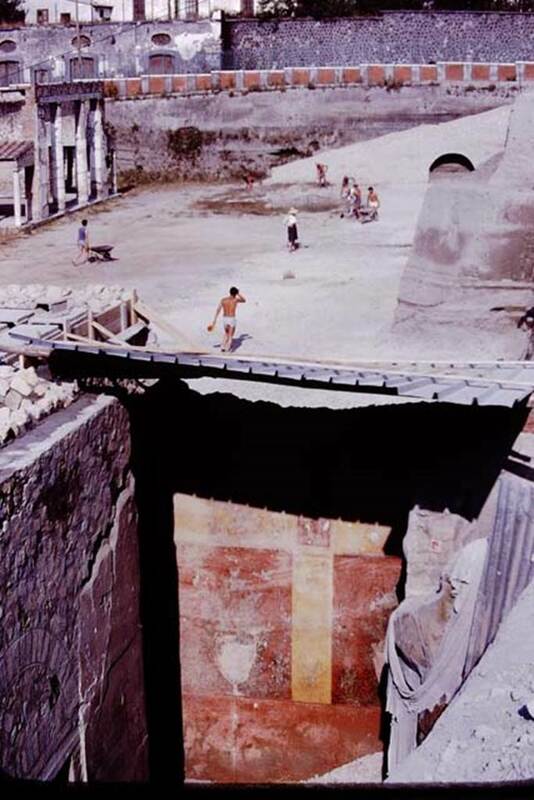 Oplontis Villa of Poppea, 1978. 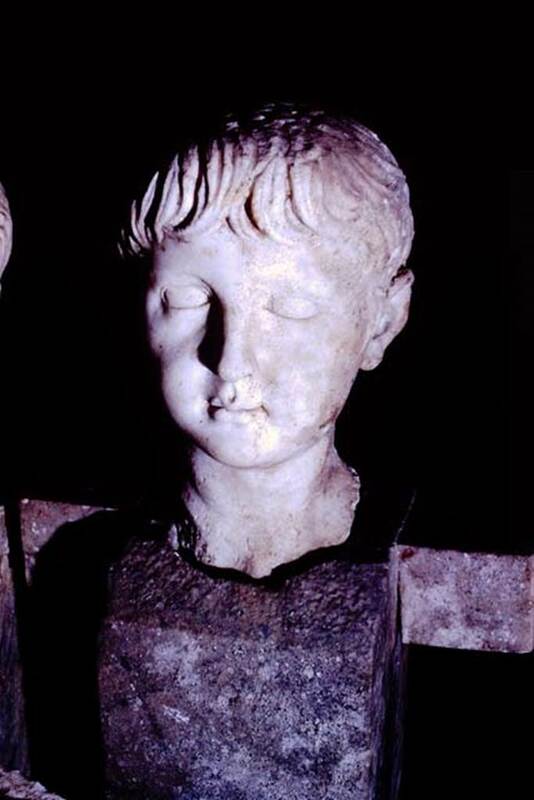 Marble head of boy found along the passageway. Oplontis Villa of Poppea, 1977. Marble head of boy on herm. Photo by Stanley A. Jashemski. 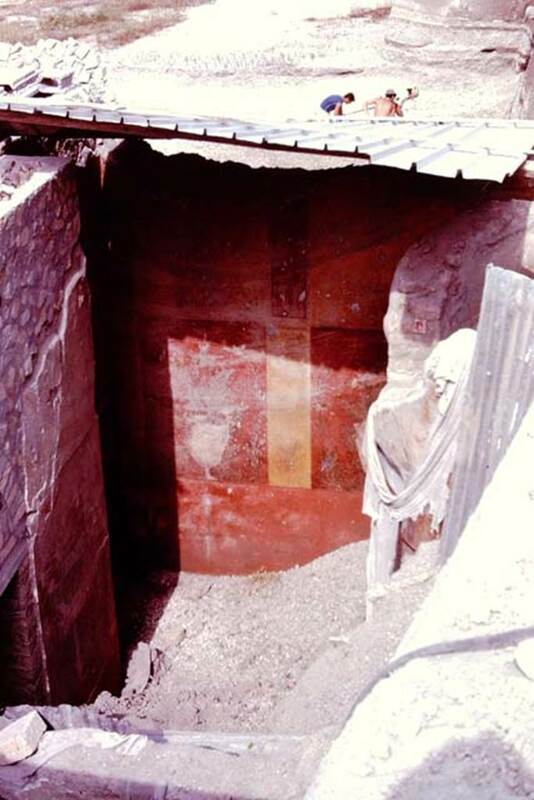 Oplontis Villa of Poppea, 1978. 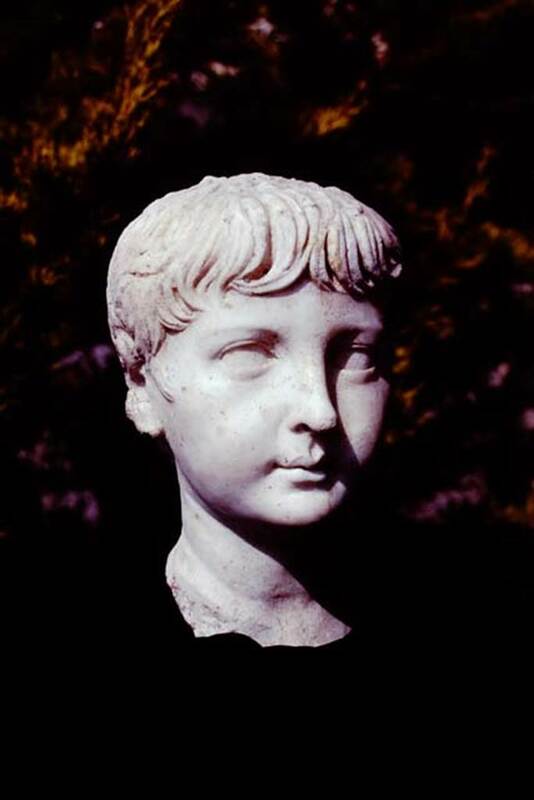 Marble head of a young boy found along the passageway. Oplontis Villa of Poppea, 1977. Marble head of boy, on herm. Looking west across rear north garden, showing shape of pathways and white painted filled root-cavities. Photo by Stanley A. Jashemski. Looking south across root-cavities, herm and path leading to room 58 and 54. Photo by Stanley A. Jashemski. Looking south across the large clump of root-cavities found at north end of rear garden. Photo by Stanley A. Jashemski. North garden, looking west along east-west pathway near villa. Photo by Stanley A. Jashemski. 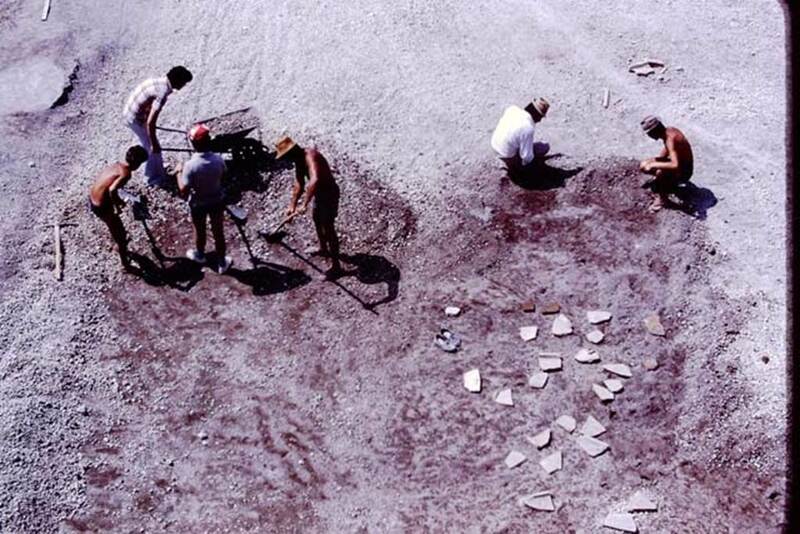 According to Wilhelmina – “During this summer we completed our excavations in the large garden at the rear, north side of the villa, which we had begun in 1974. Last summer, the considerable area at the rear of this garden had still been covered with large stones and other debris left when the villa had been reconstructed and the retaining wall above had been built. 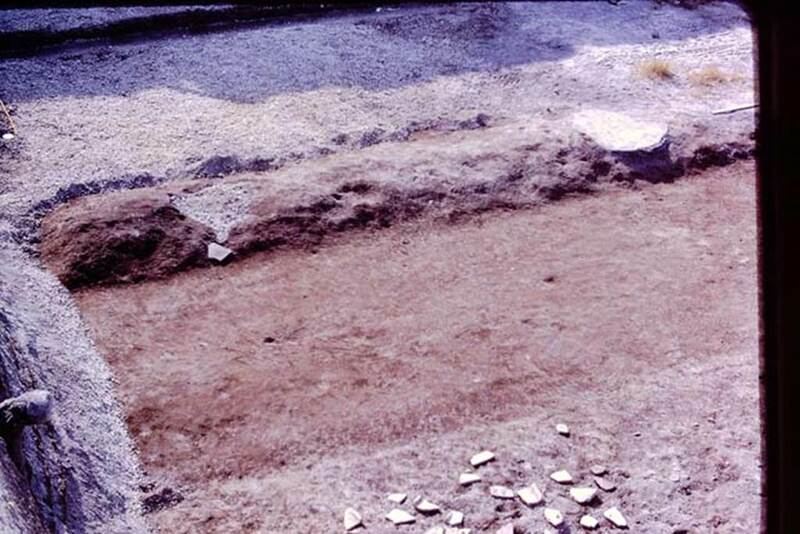 When we had completed our excavations, the layout of the garden became much clearer. A central walkway in the rear garden extended the centre line of the villa. At the east edge of the garden were two parallel passageways separated by a row of five huge trees, which were arranged in a mounded bed. North garden, looking west along north side near unexcavated, showing the lines of the pathways. Oplontis Villa of Poppea, 1977. North garden, looking west along north side near unexcavated. The large clump of cavities, probably small trees or shrubs, possibly oleanders, can be seen on the right. On the left is the filled white painted root cavity of the fourth large tree. The large clump of cavities, probably small trees or shrubs, possibly oleanders, can be seen on the left. In the centre is the filled white painted root cavity of the fifth large tree. Oplontis Villa of Poppea, 1977. North garden, looking south-west across garden area. Across the centre is the filled white painted line of five root cavities belonging to five large trees. 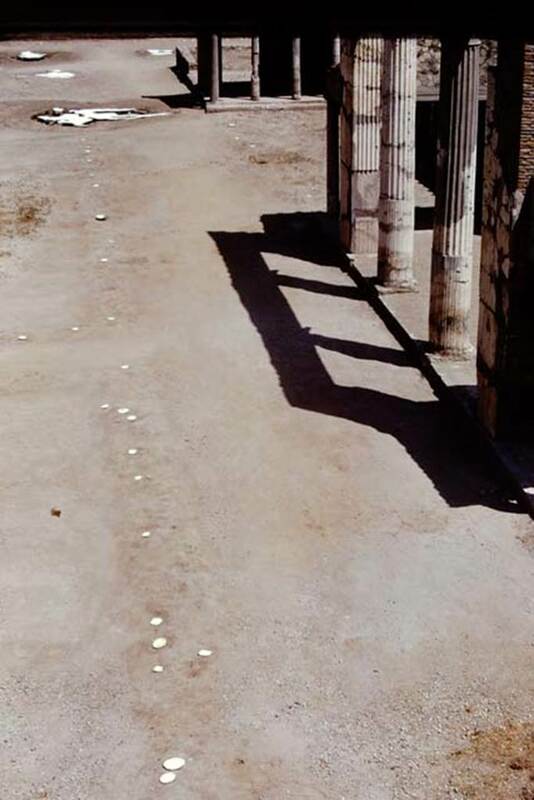 On the left, along the edge of the portico, is a row of smaller root cavities, later identified as daisy chrysanthemums. Oplontis Villa of Poppea, 1977. North garden, looking south-east across garden area. The large clump of cavities, probably small trees or shrubs, possibly oleanders, can be seen in the lower centre. In the top left, along the edge of the portico, is a row of smaller root cavities, later identified as daisy chrysanthemums.